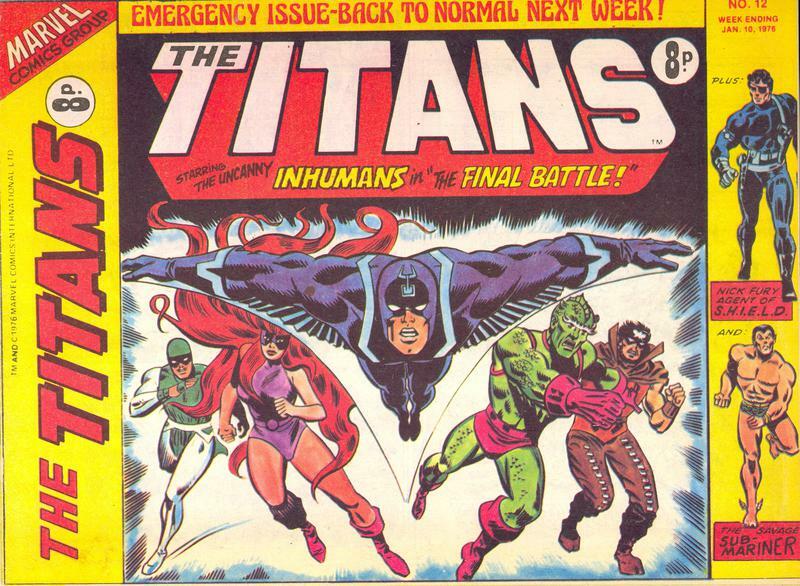 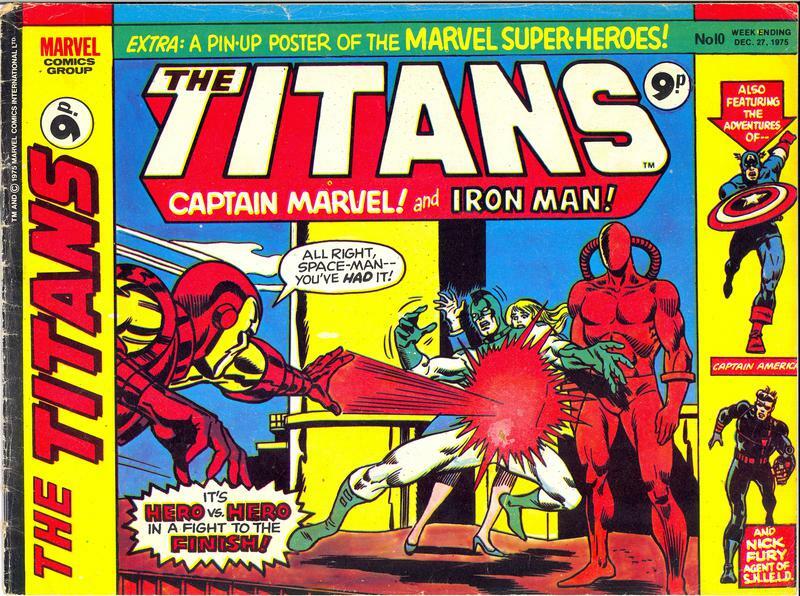 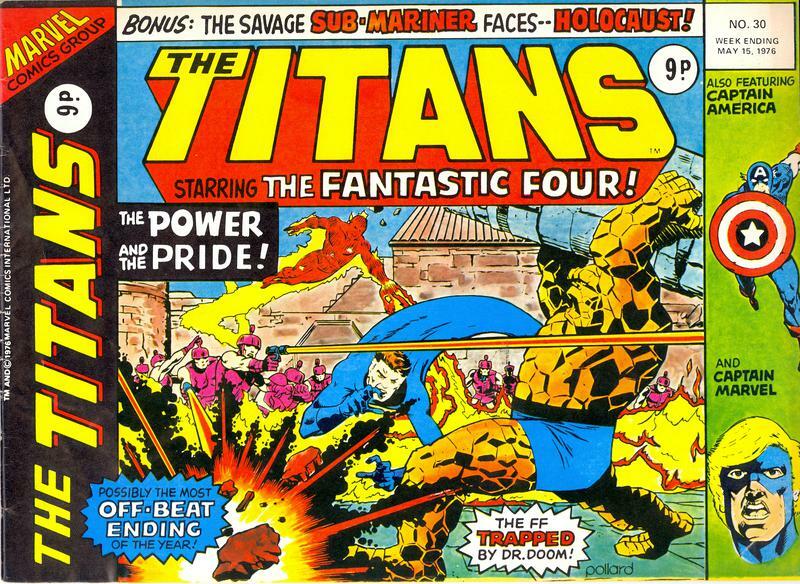 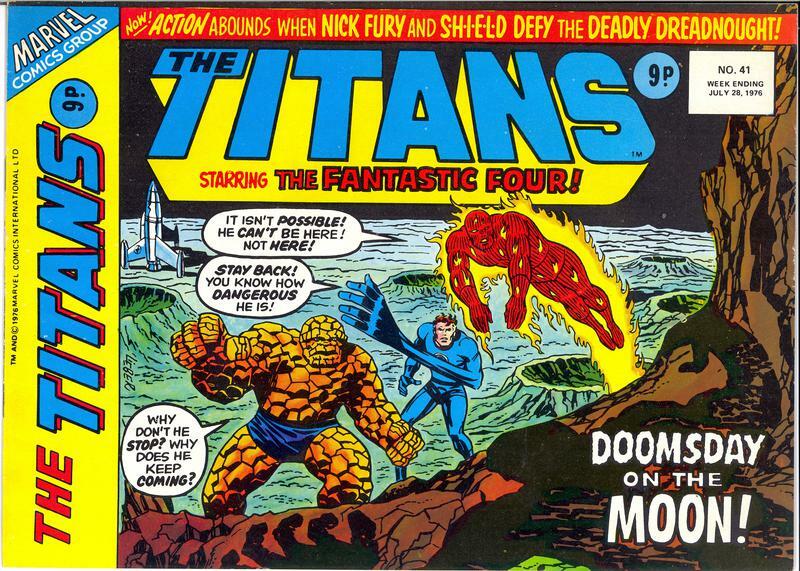 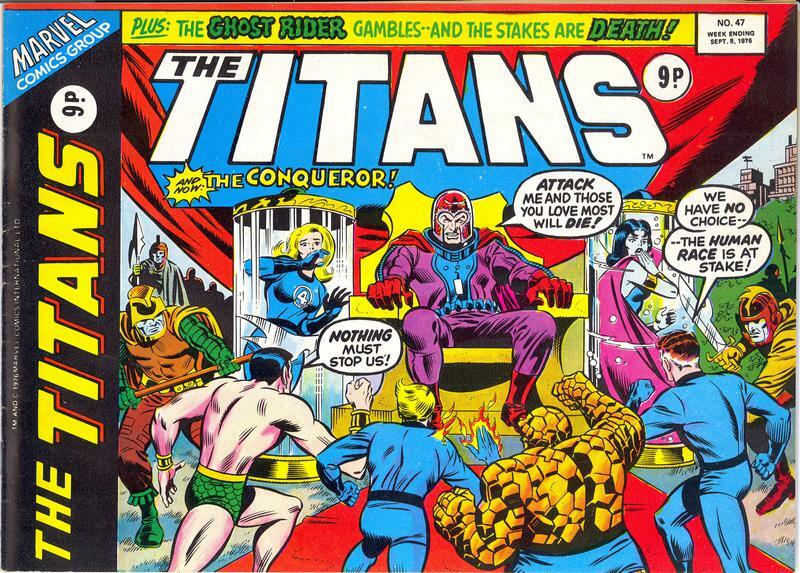 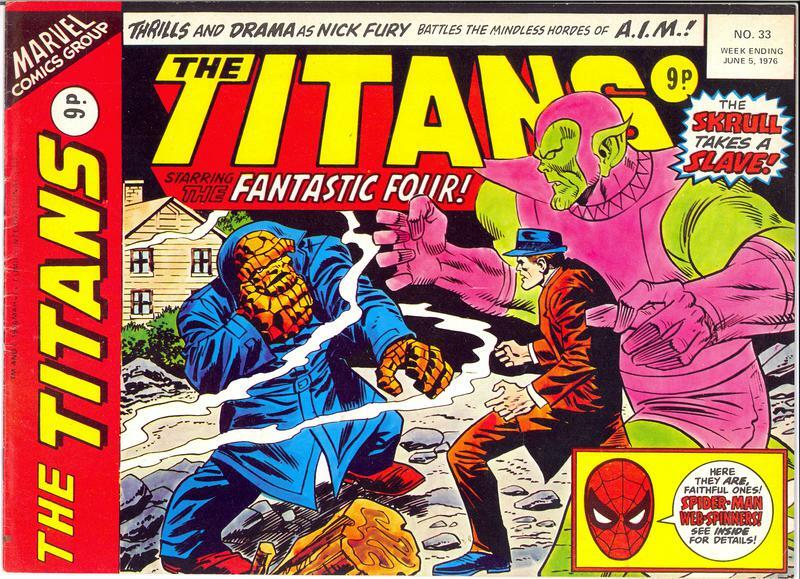 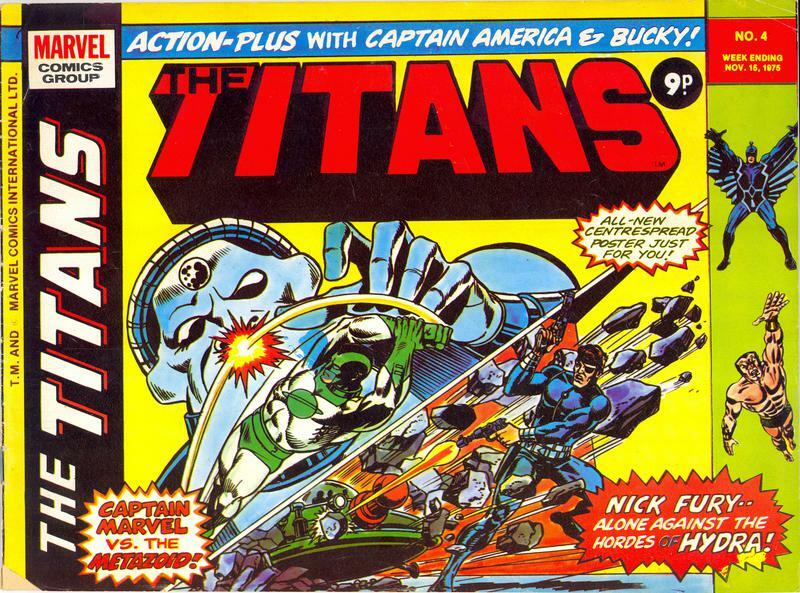 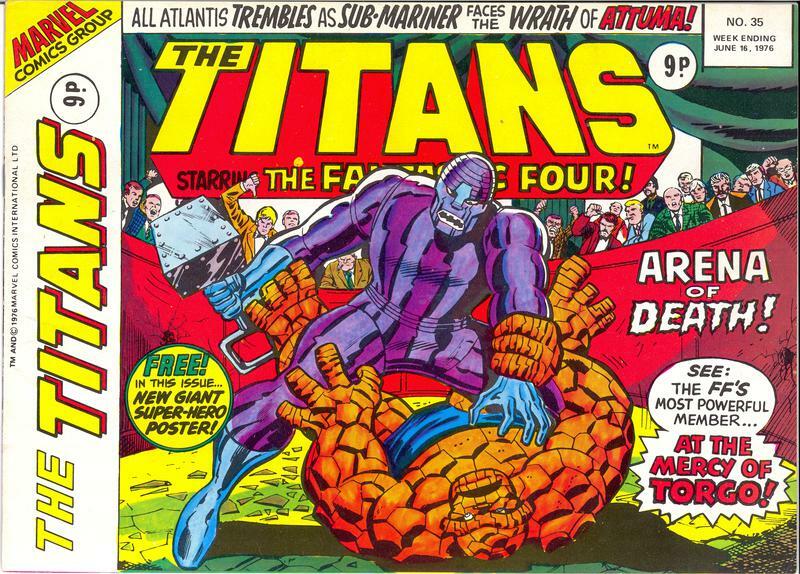 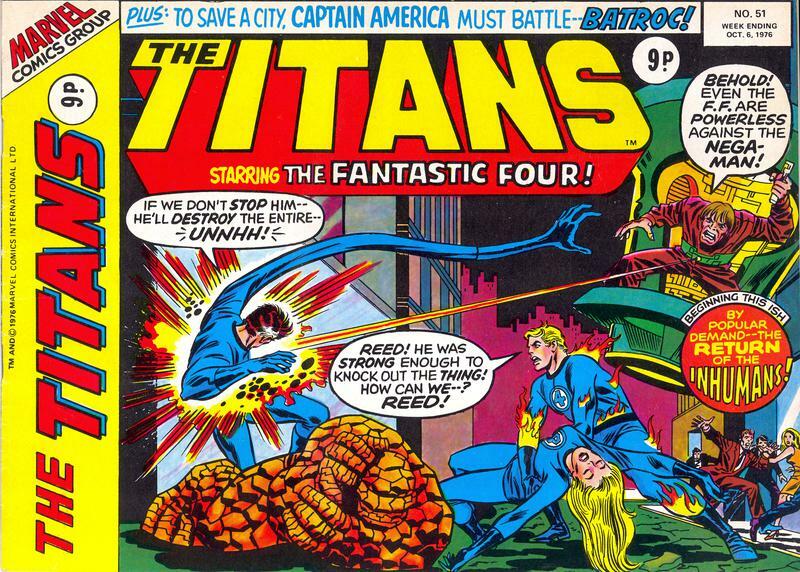 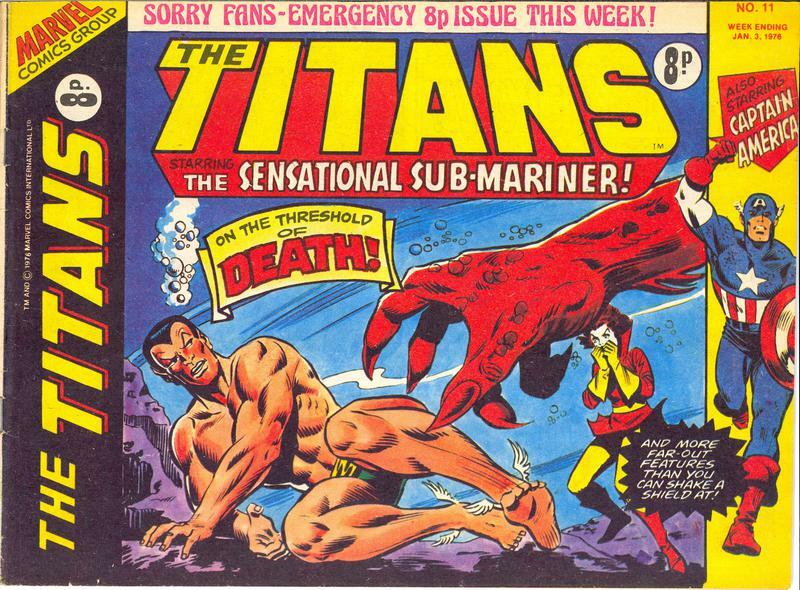 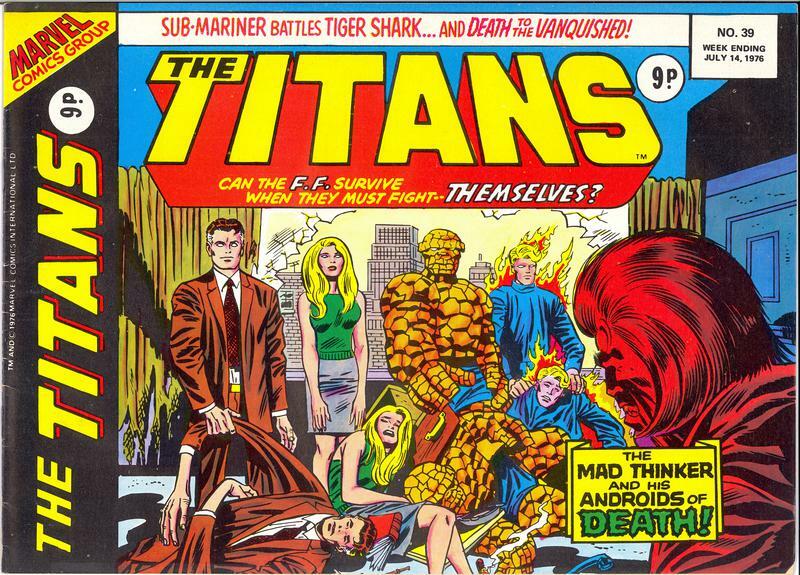 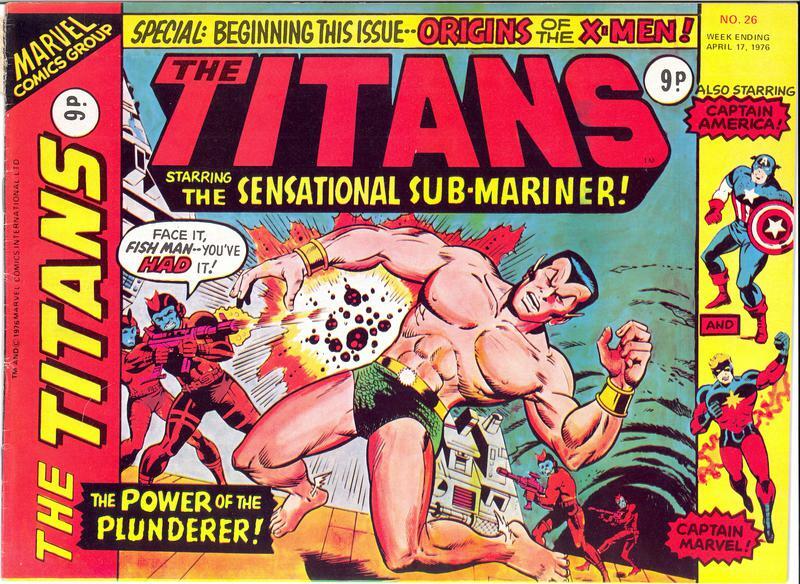 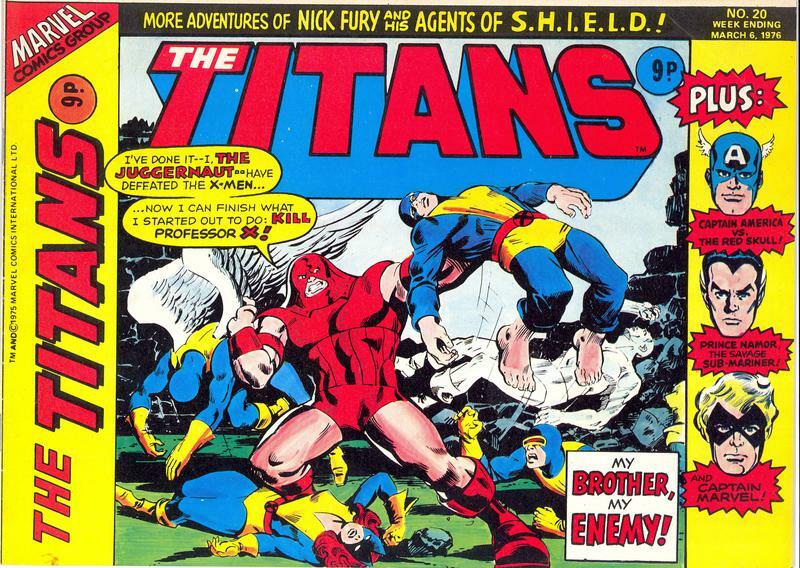 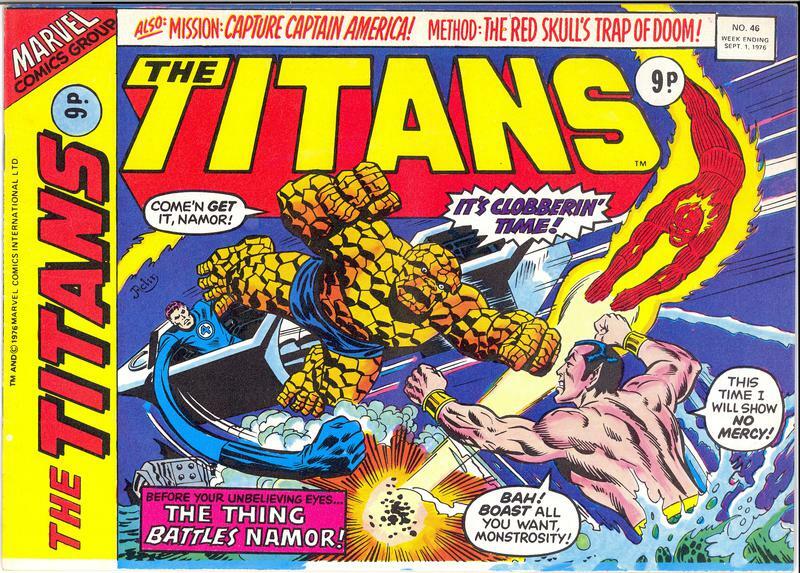 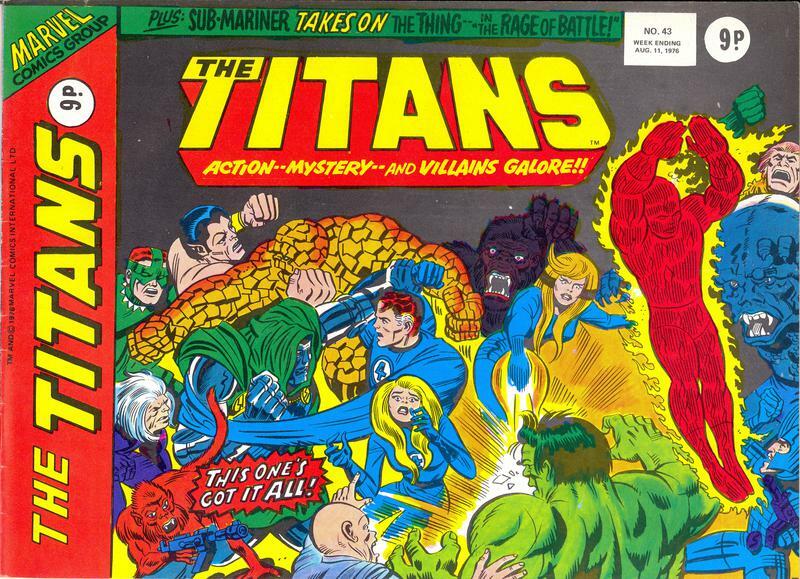 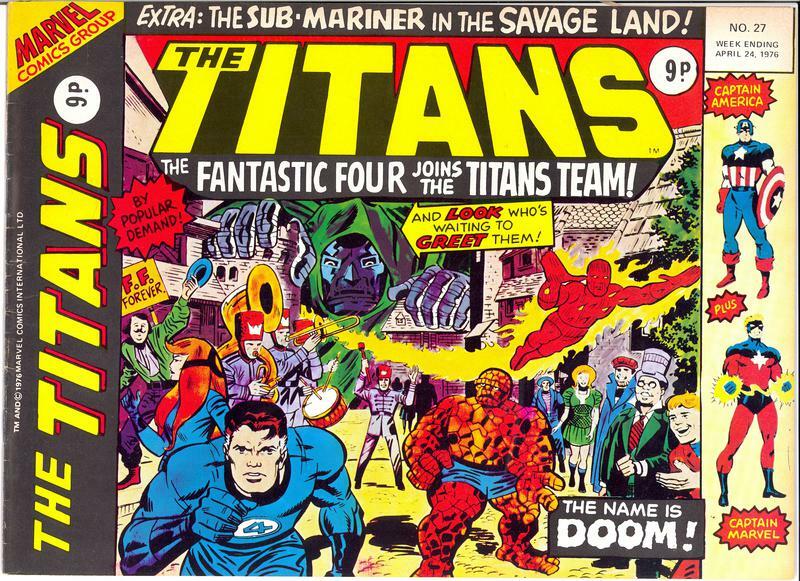 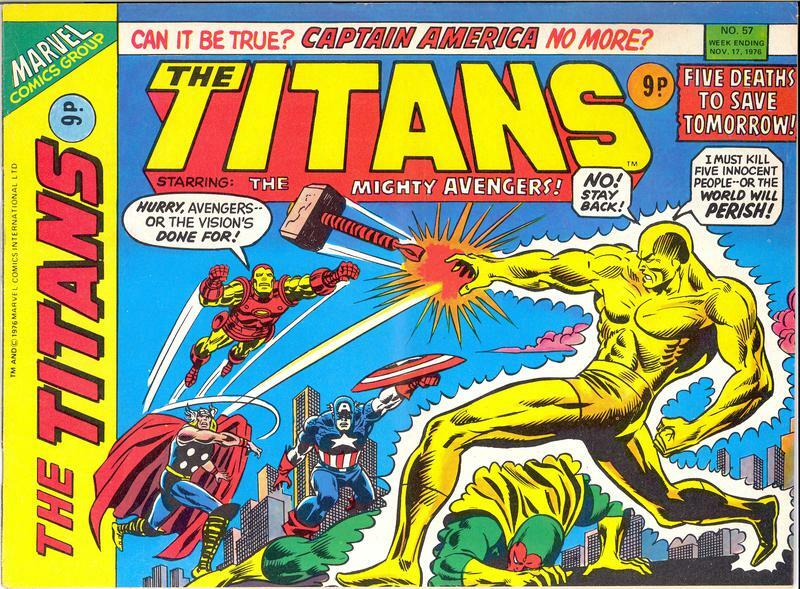 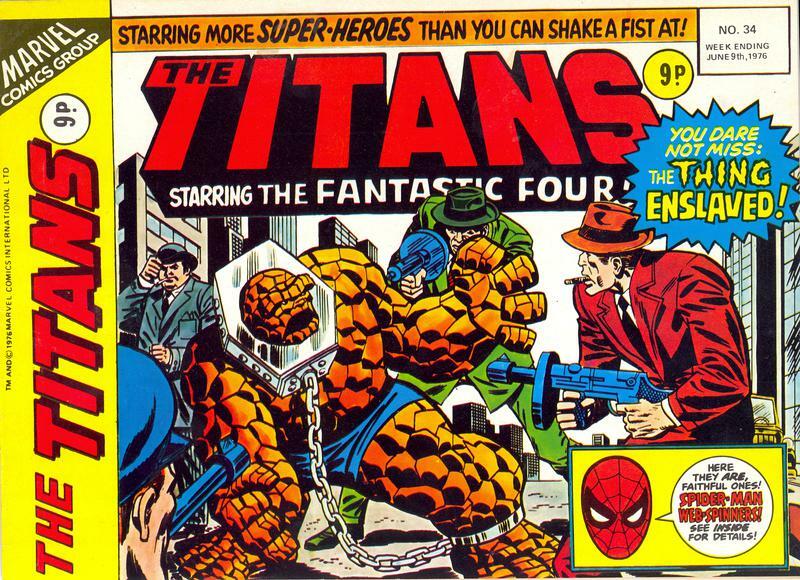 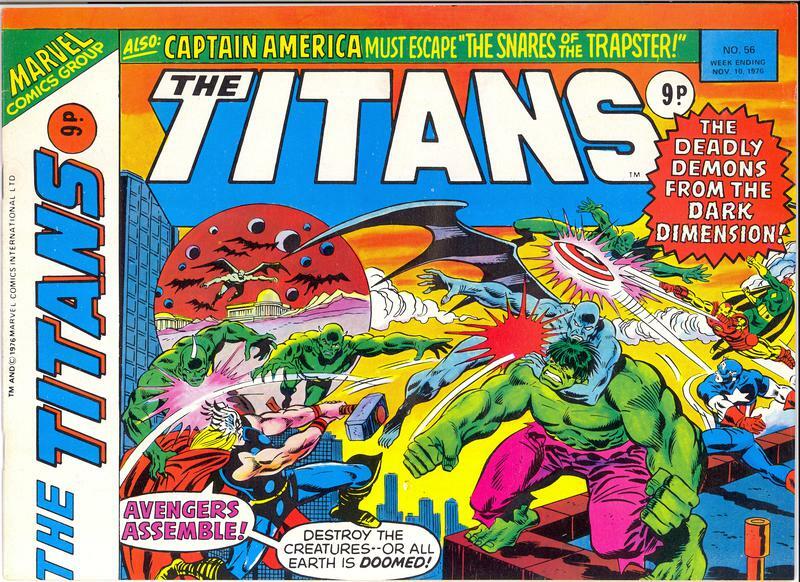 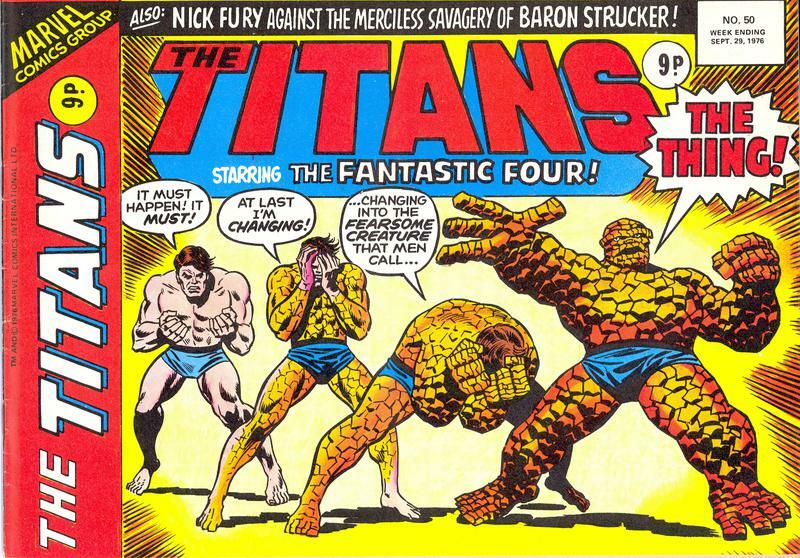 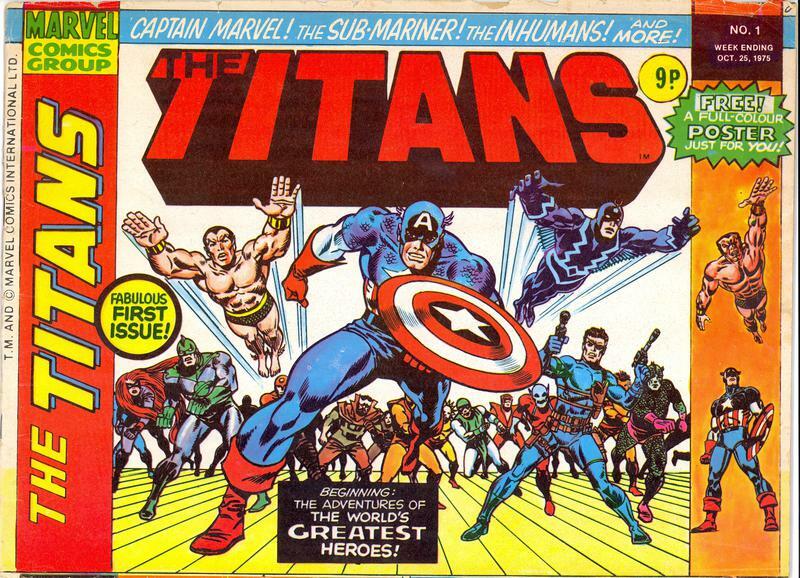 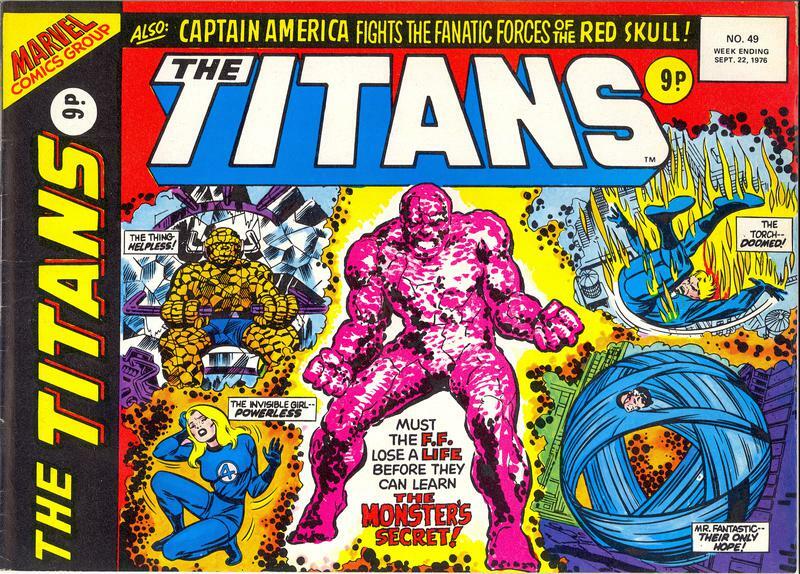 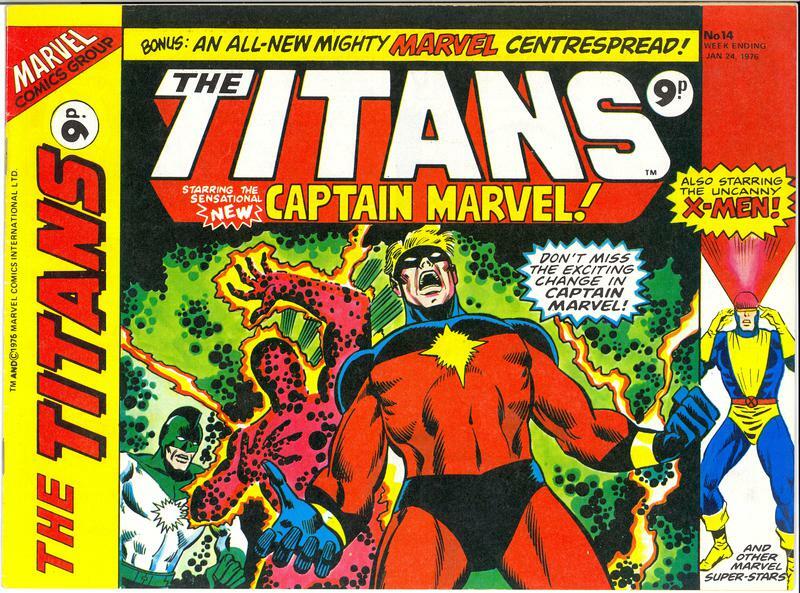 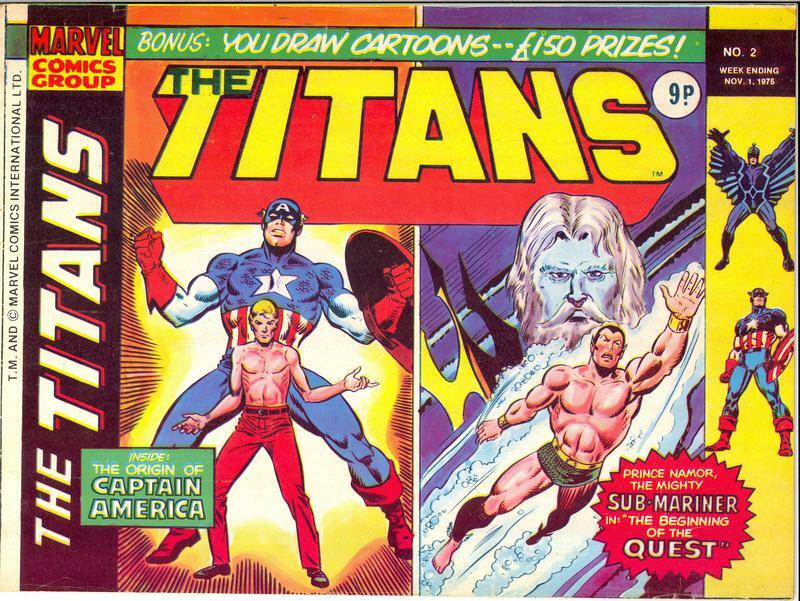 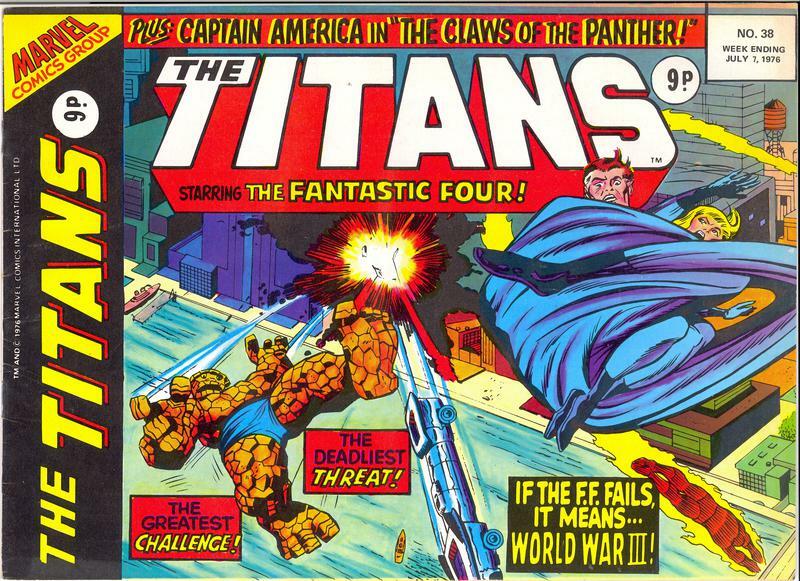 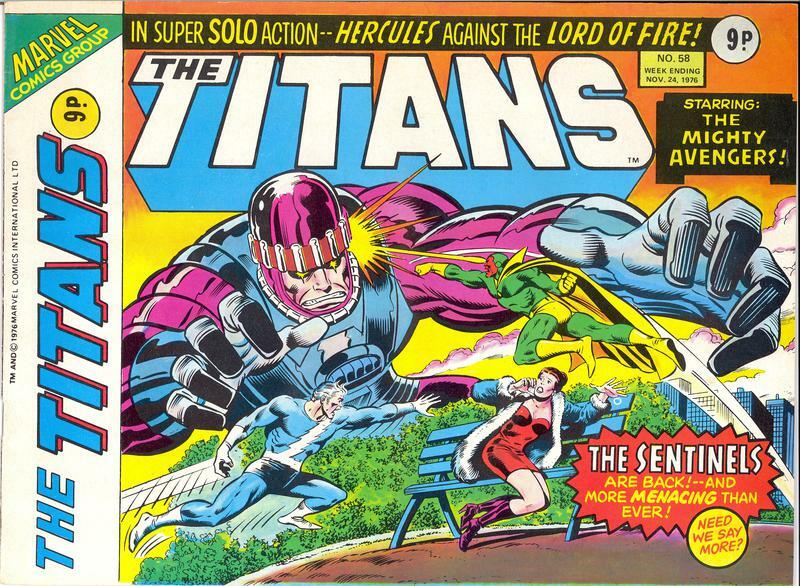 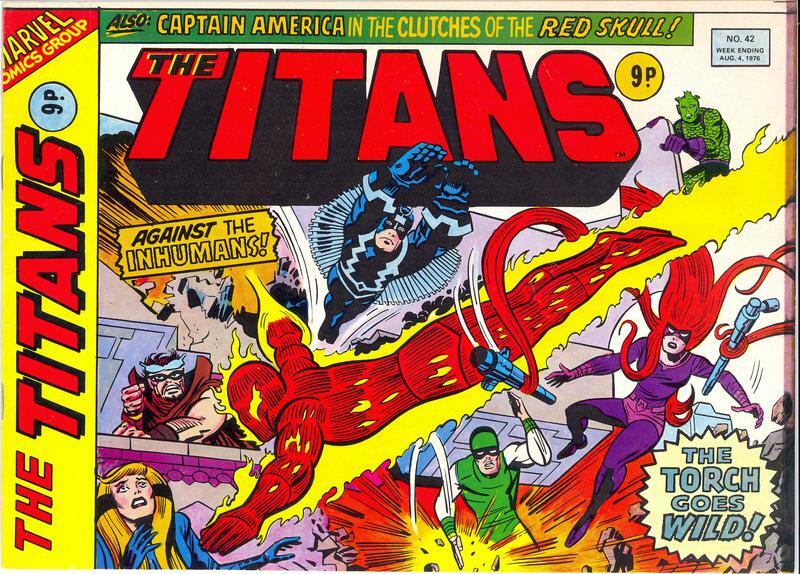 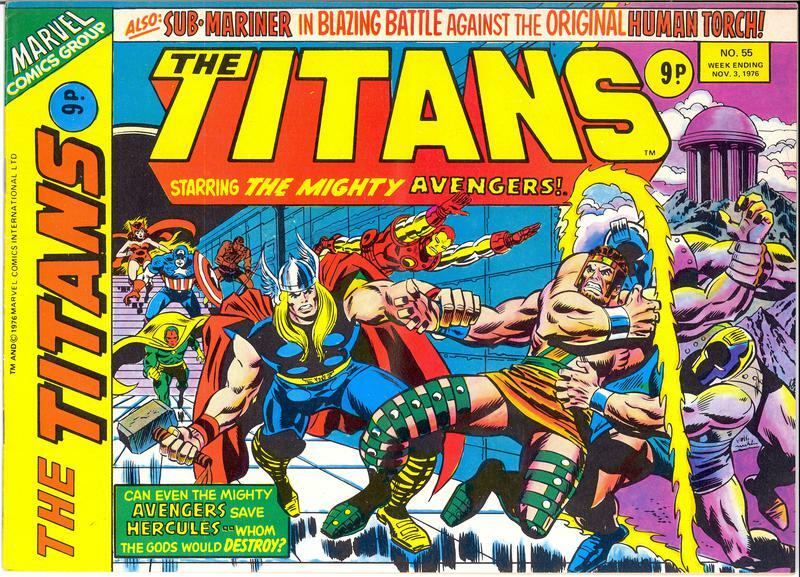 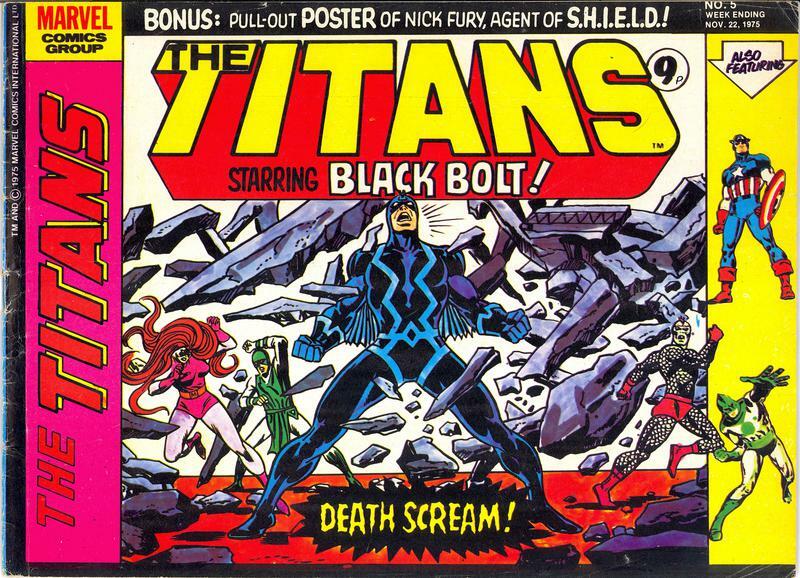 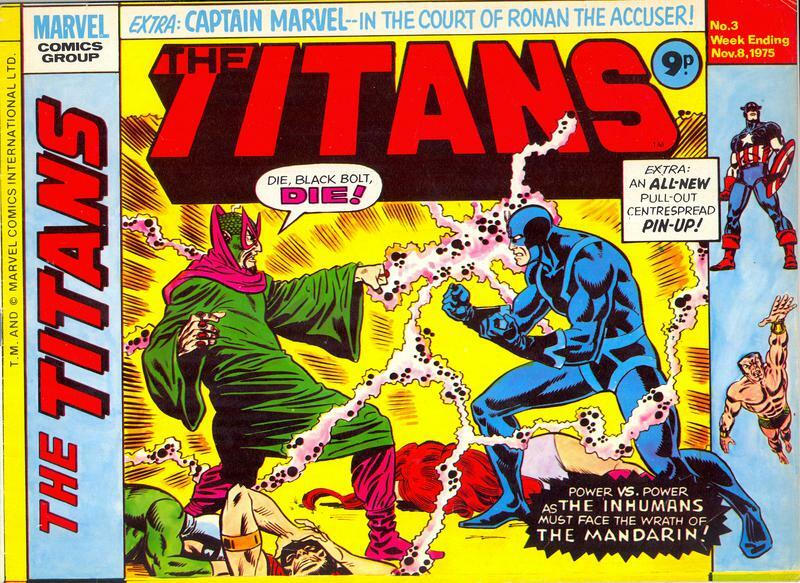 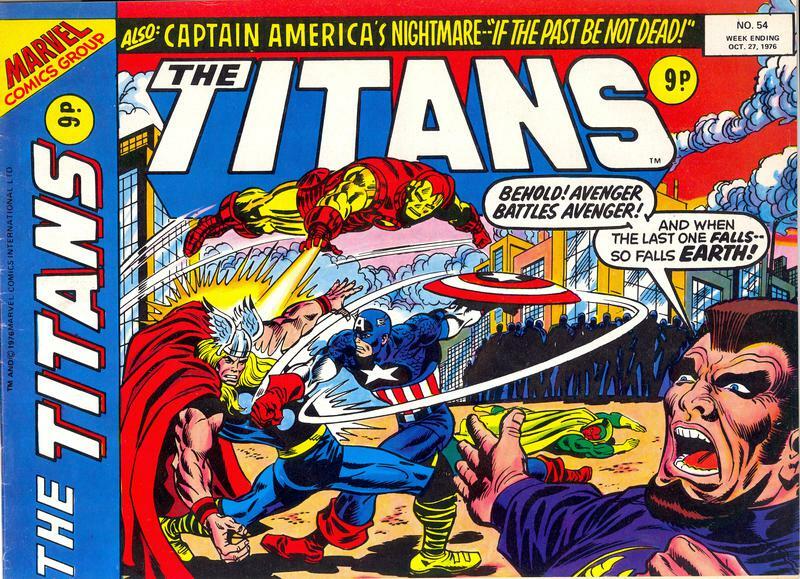 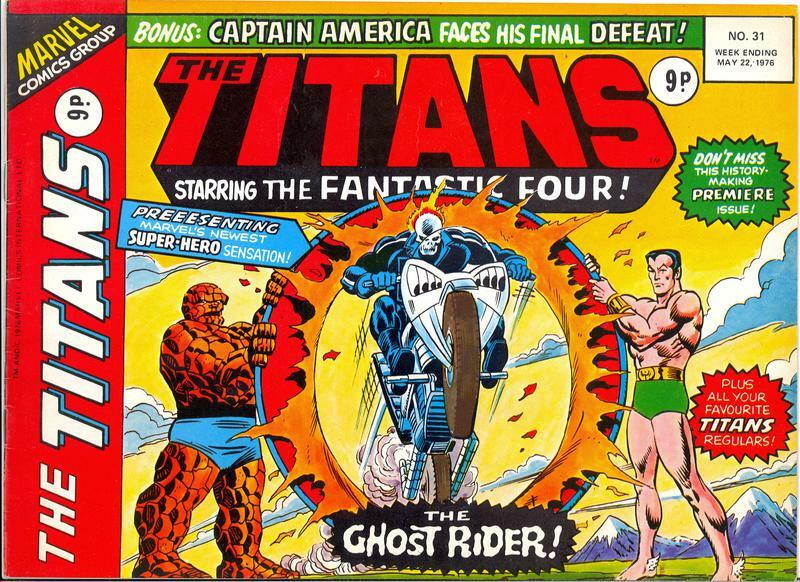 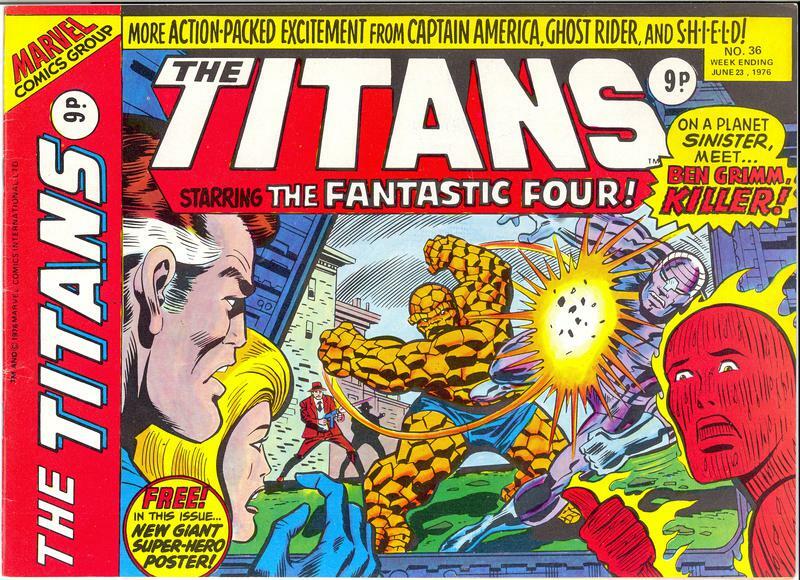 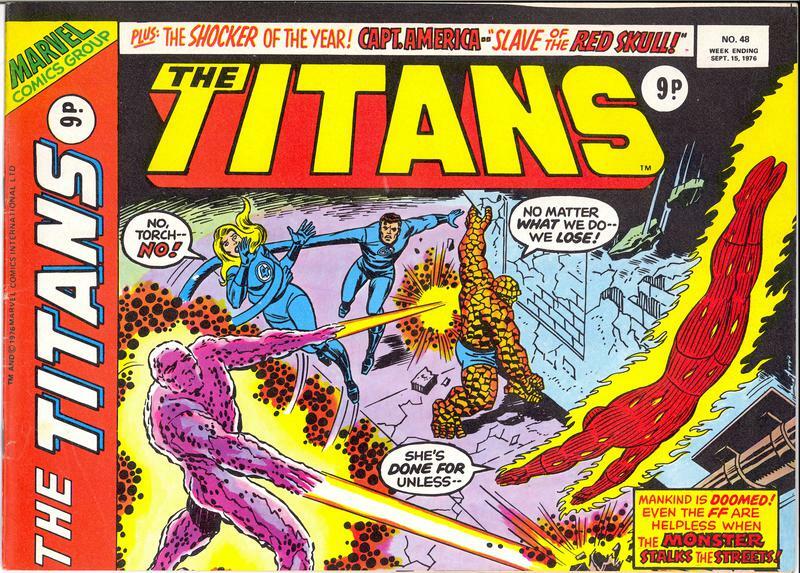 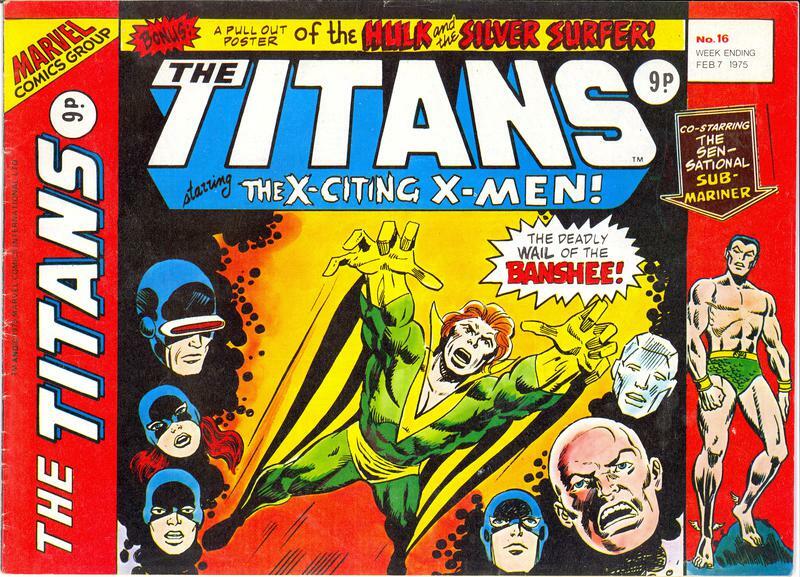 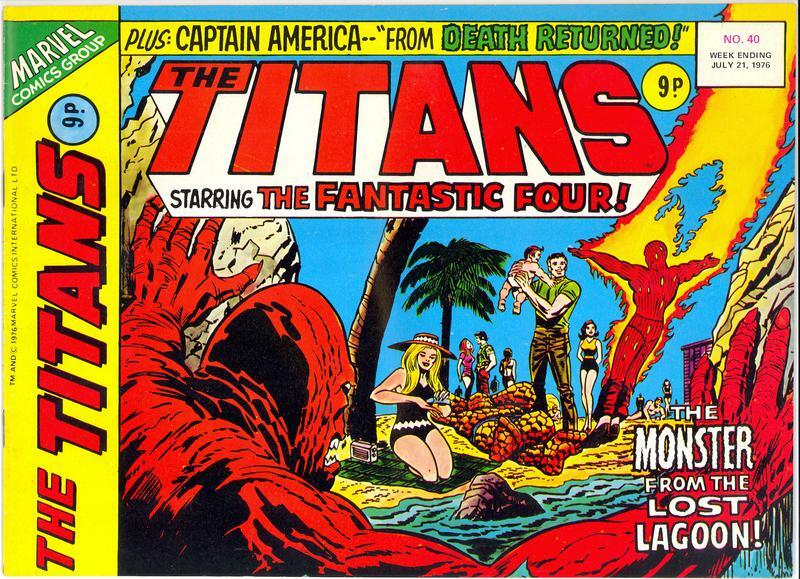 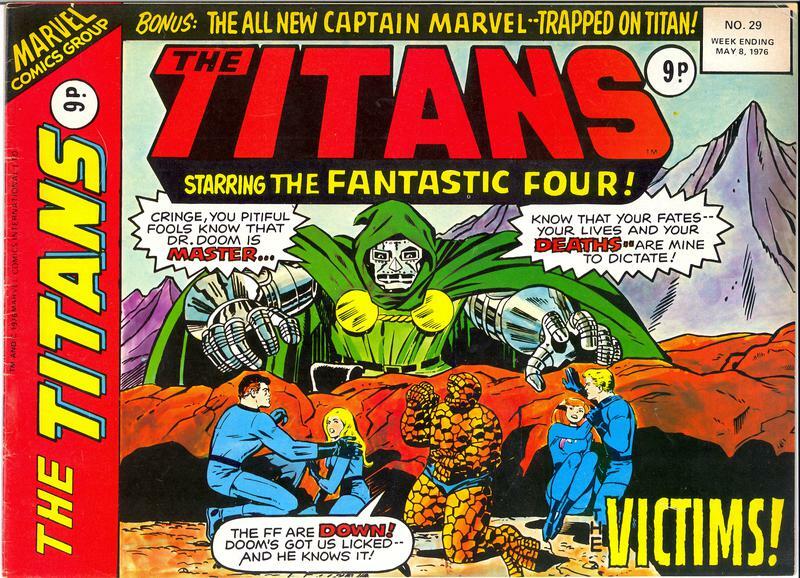 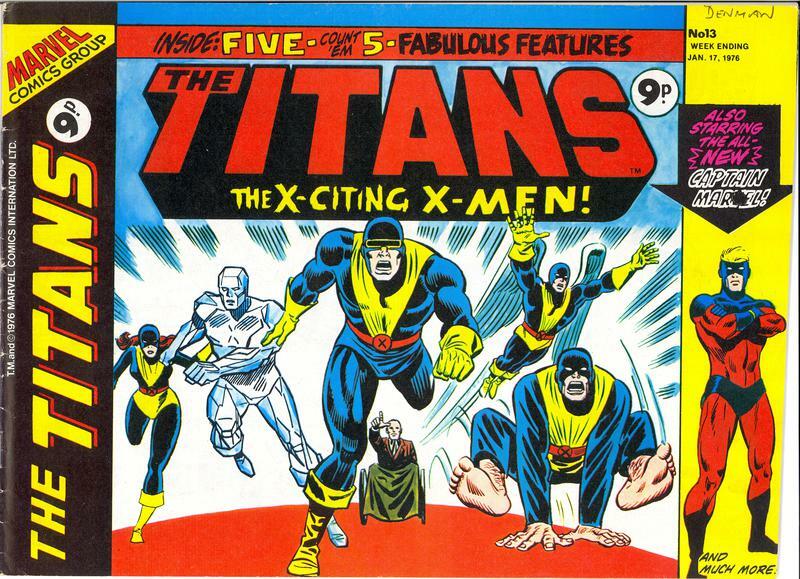 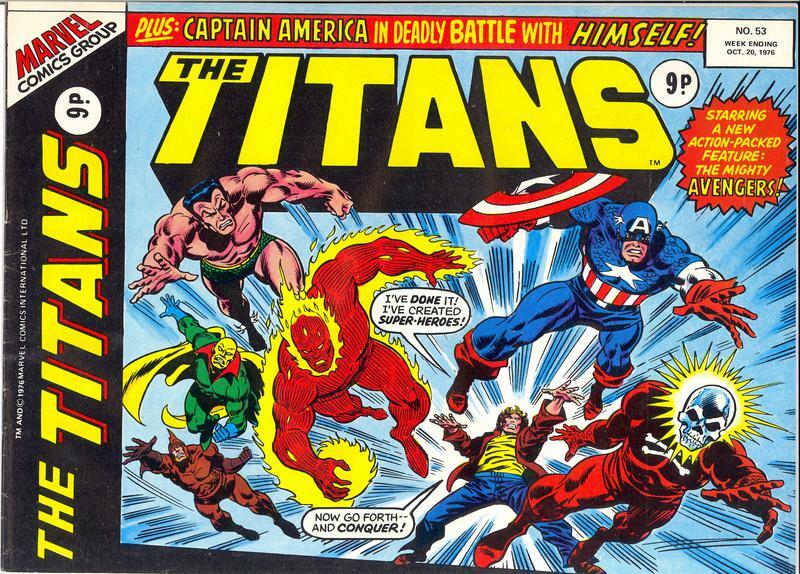 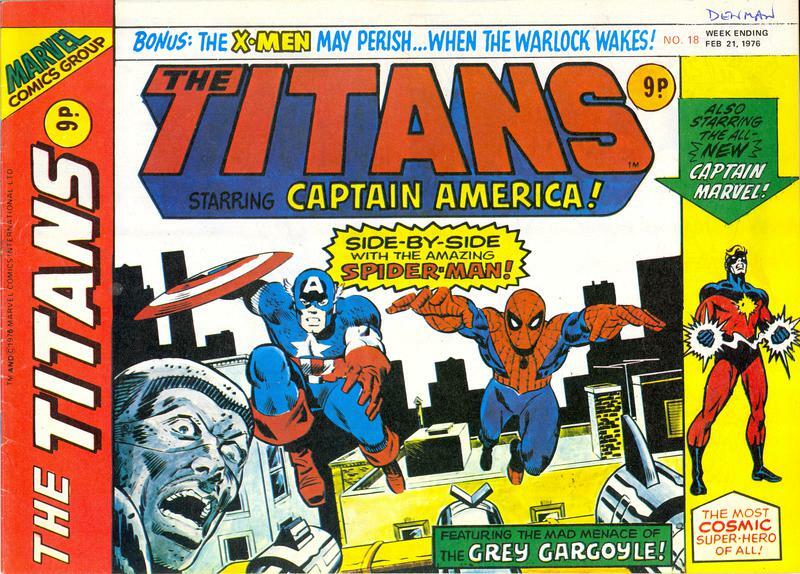 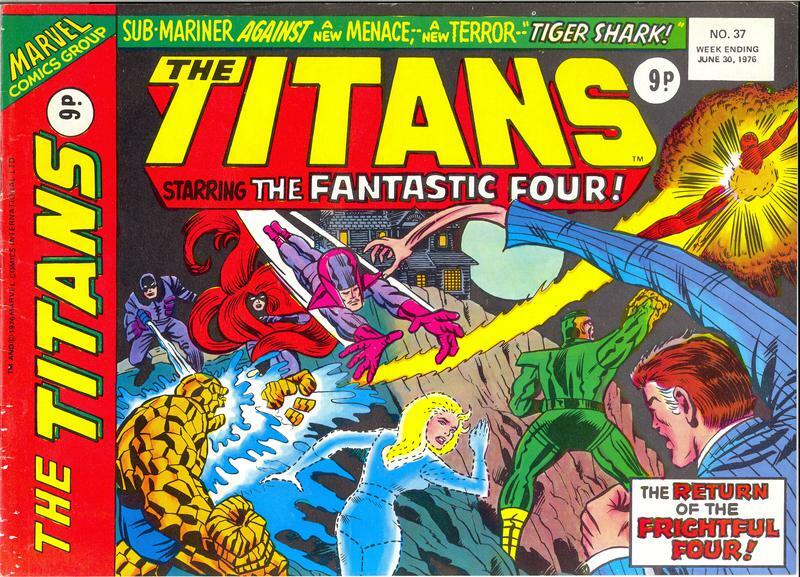 The Titans made its debut in October '75 (Marvel U.K.'s 5th superhero title) and was notable for its use of a "landscape" orientation. 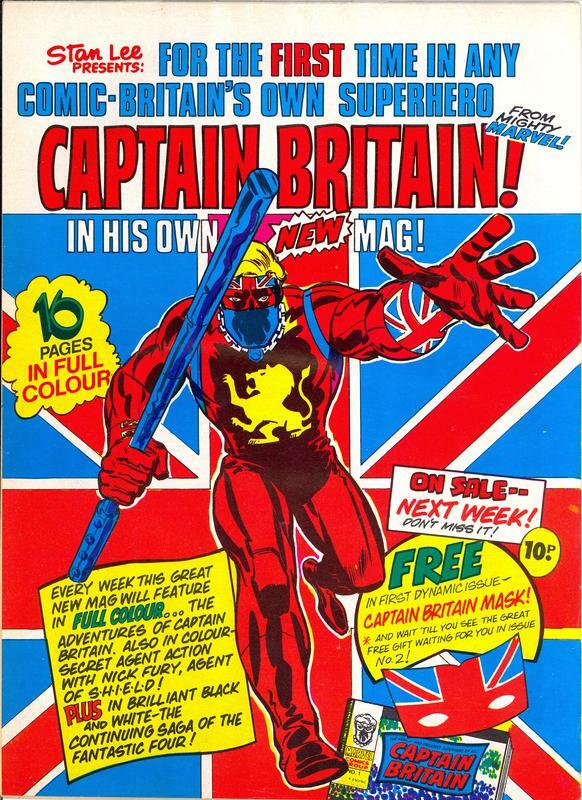 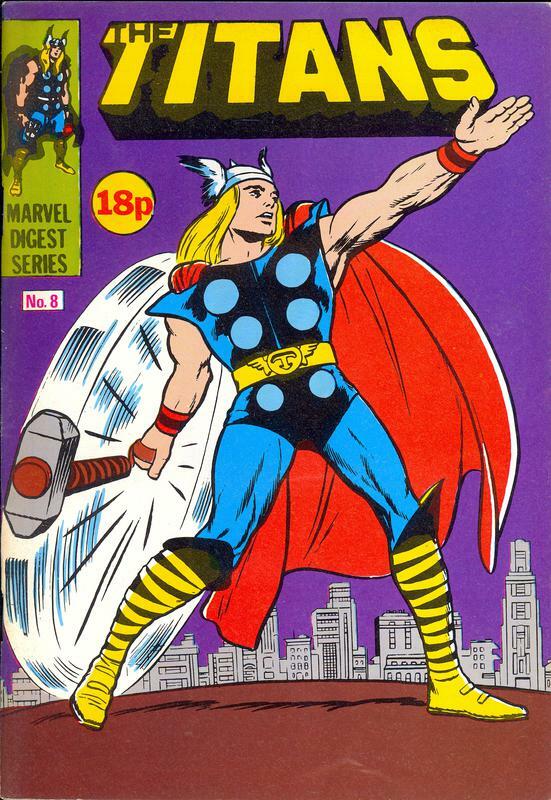 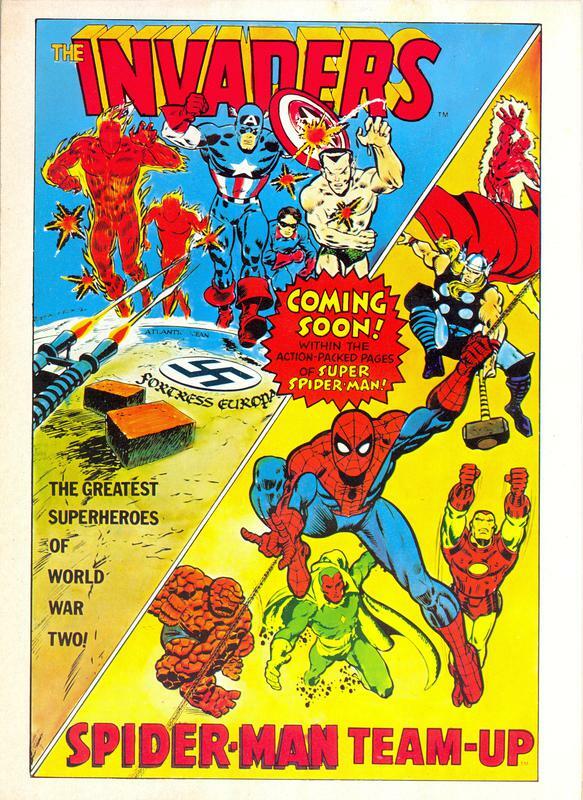 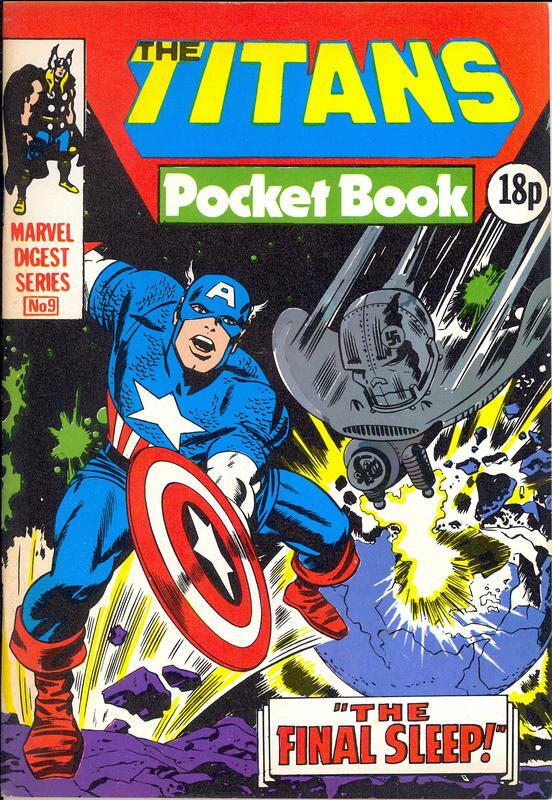 Although this format allowed two pages of Marvel U.S. artwork to fit onto one (magazine-sized) Marvel U.K. page, reader reaction was mixed, as it made the text small and often difficult to read. 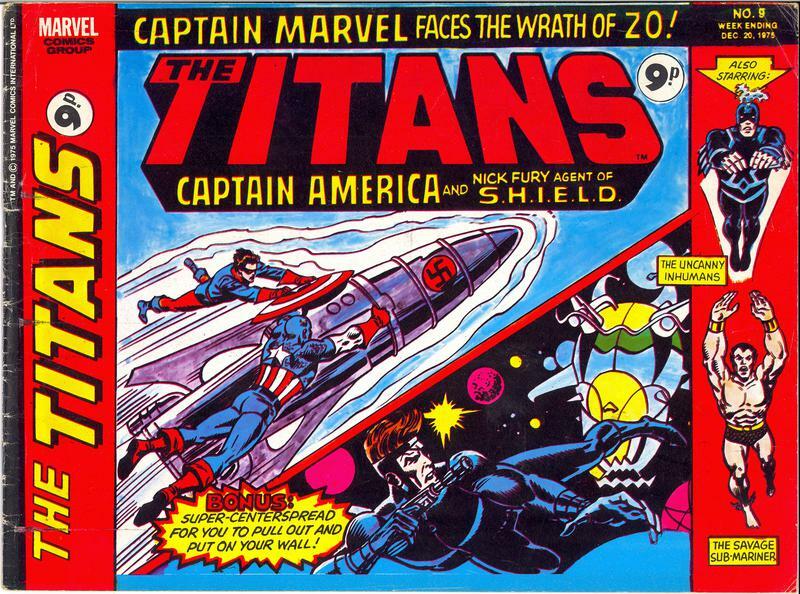 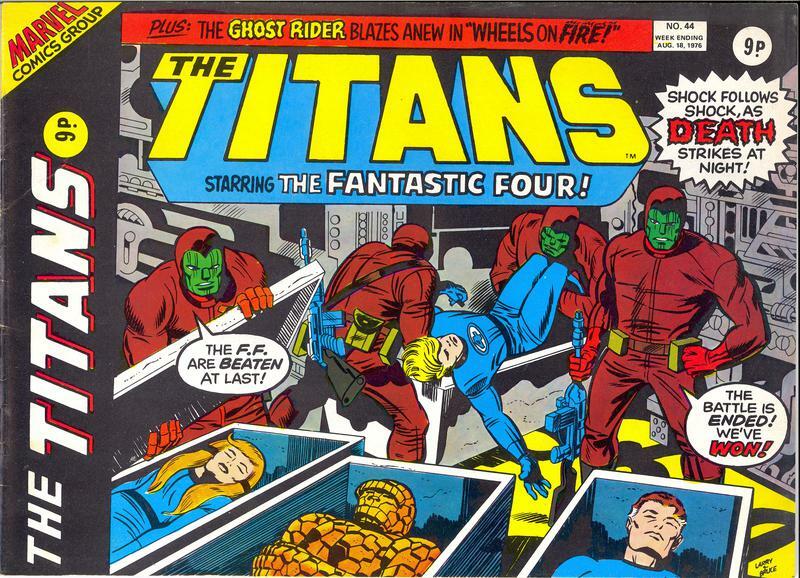 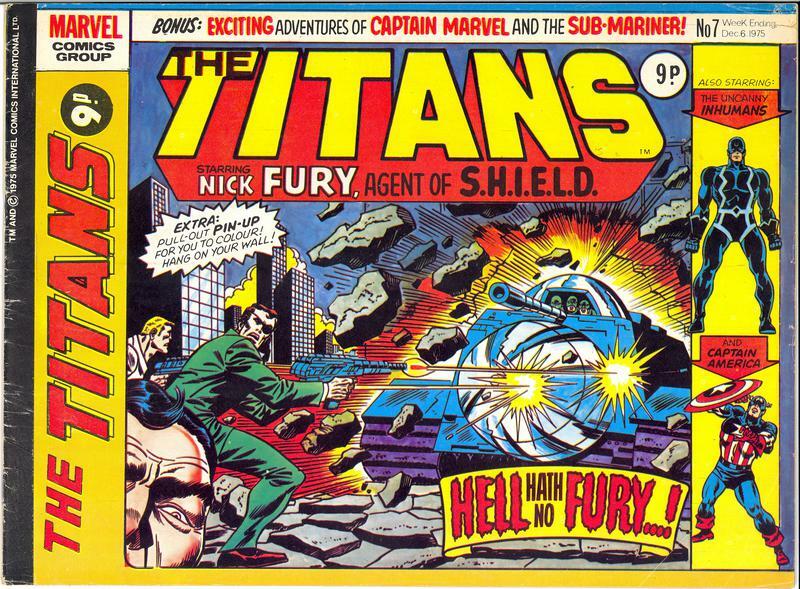 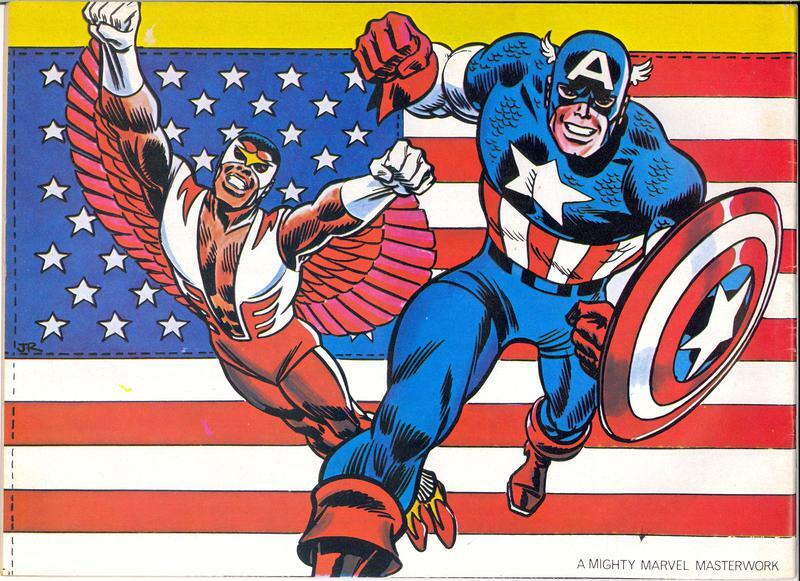 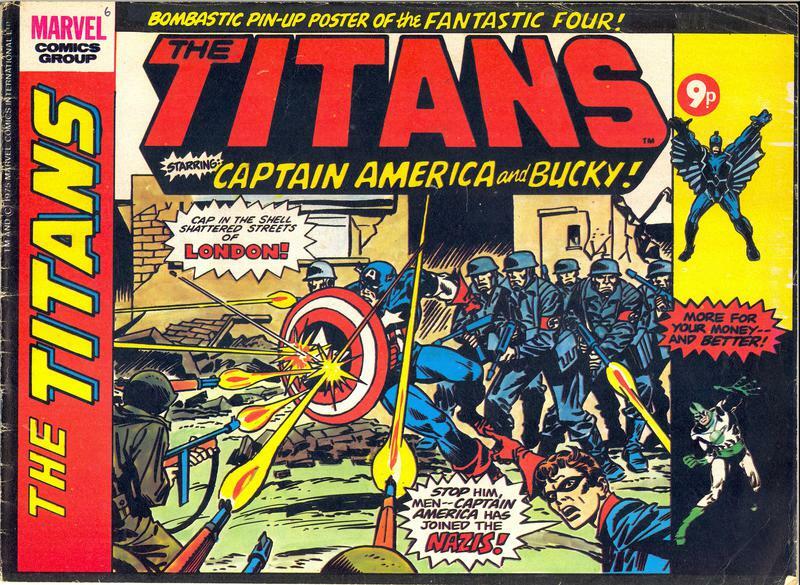 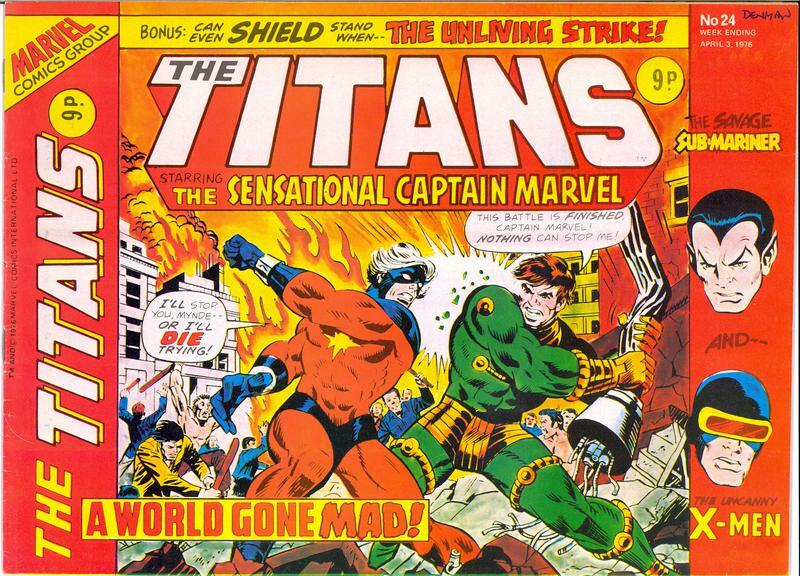 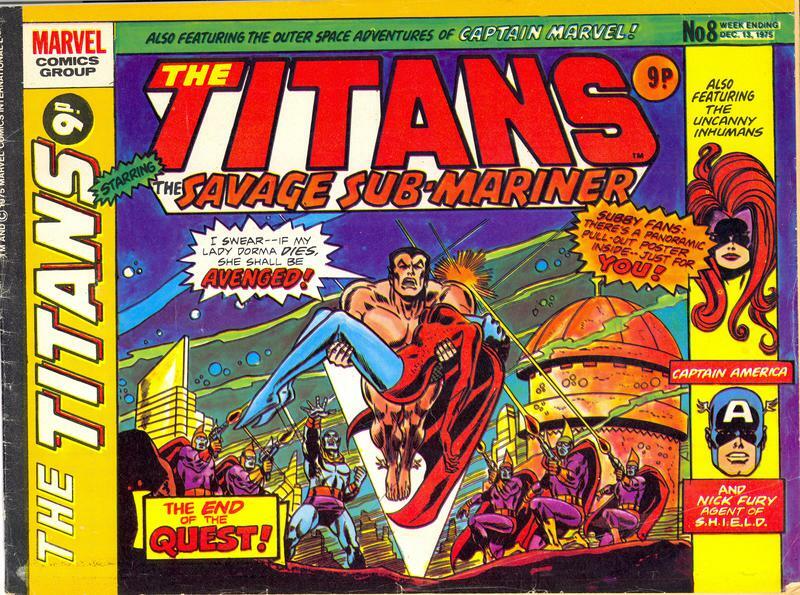 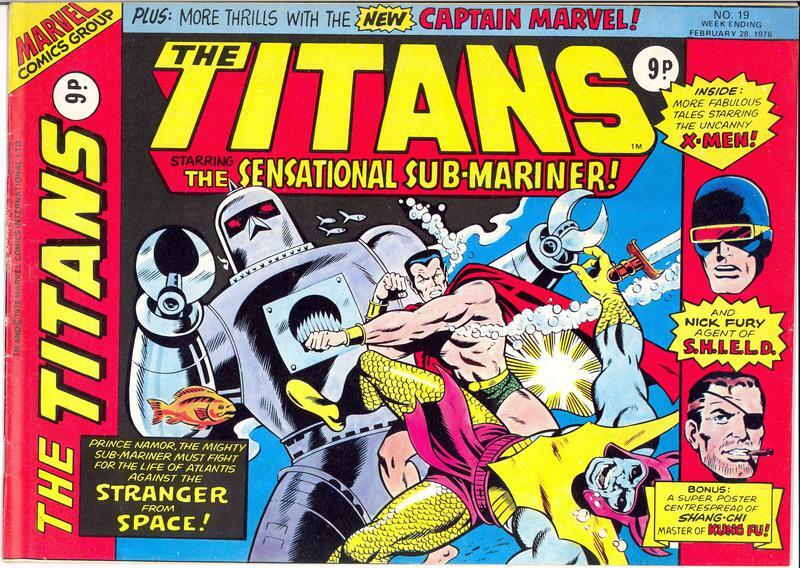 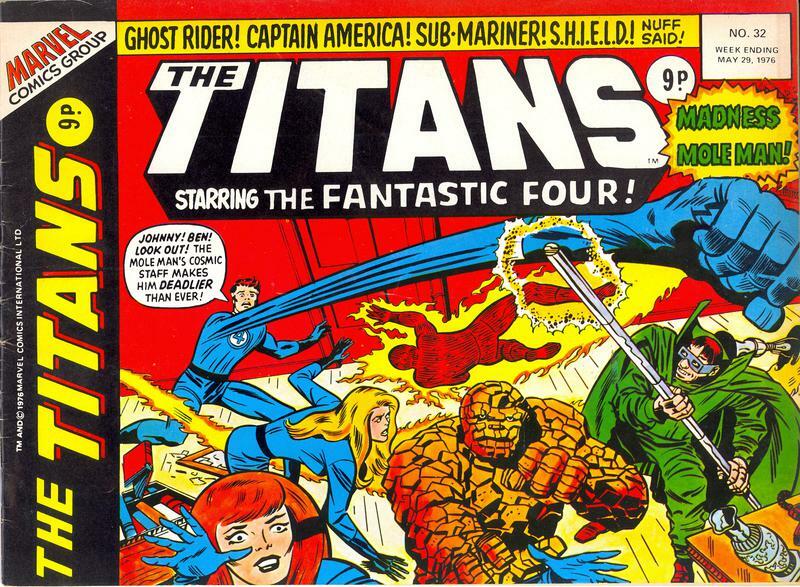 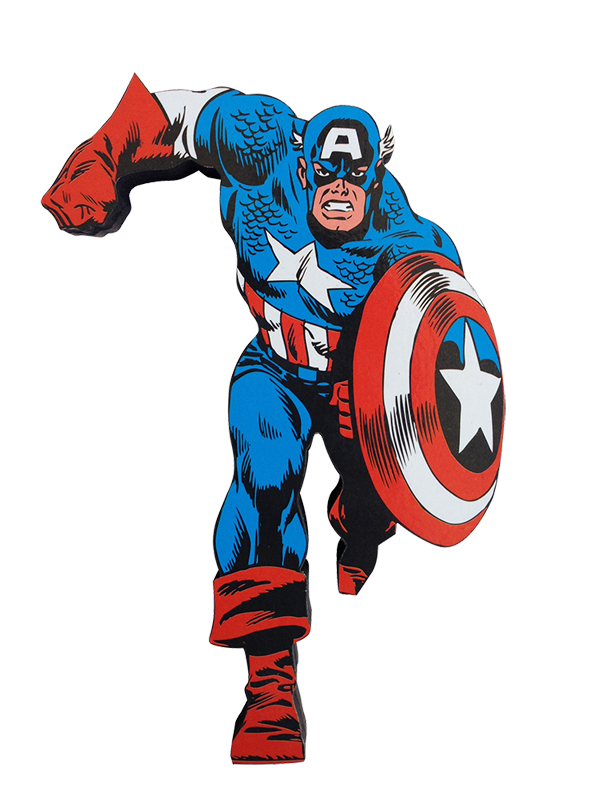 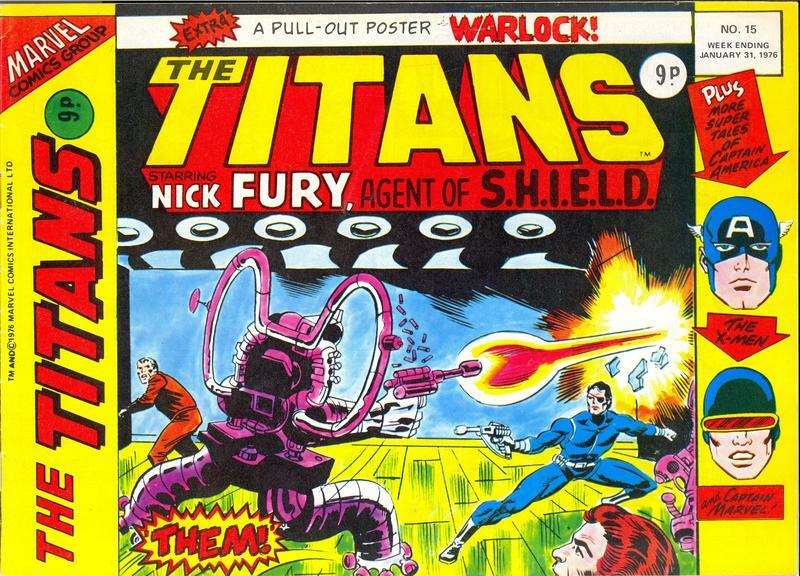 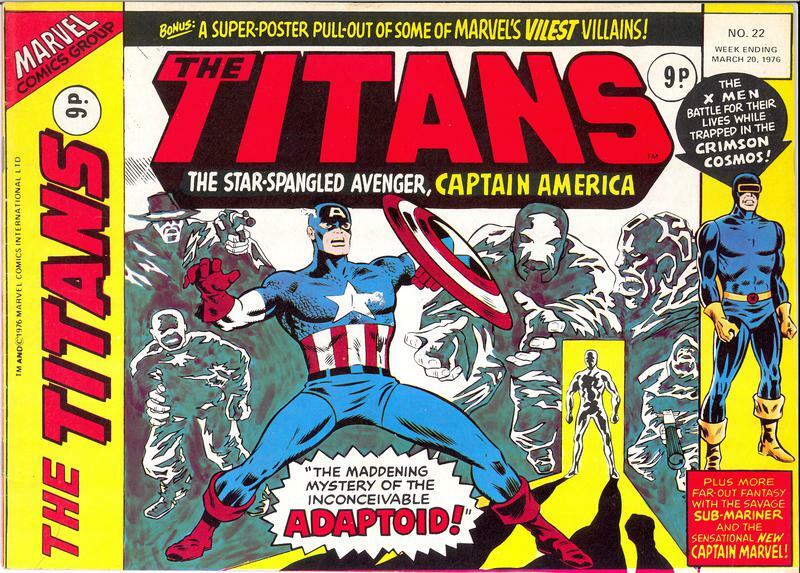 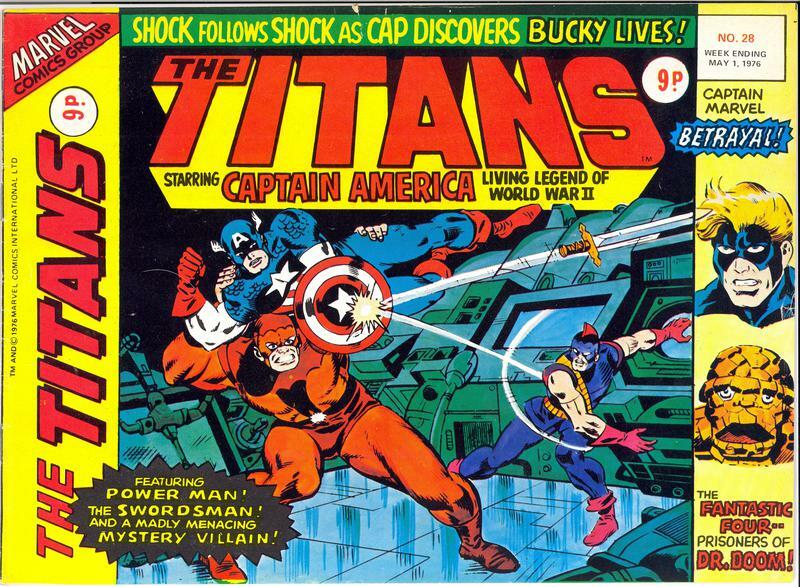 The Titans featured well-known characters like Captain America, Captain Marvel, the Sub-Mariner, the Inhumans, and Nick Fury, Agent of S.H.I.E.L.D. 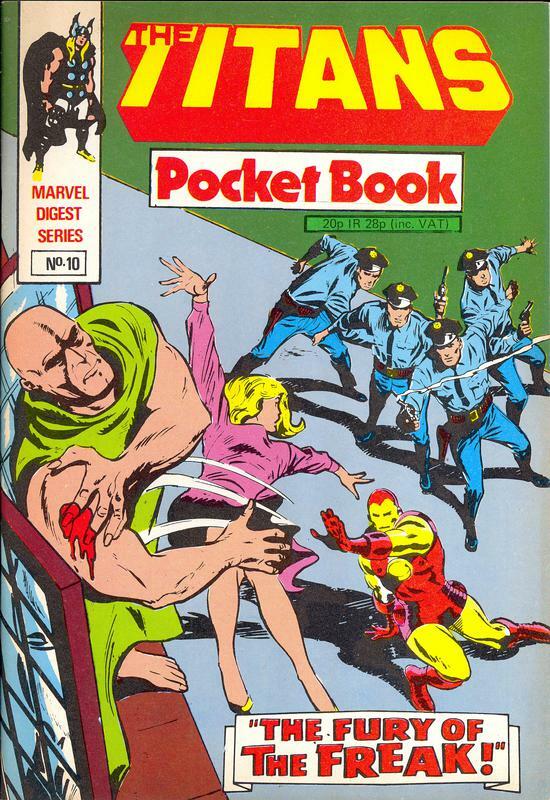 In March '80, as part of the "Marvel Revolution", Dez Skinn launched the Marvel Pocket Books line with four 52-page titles. 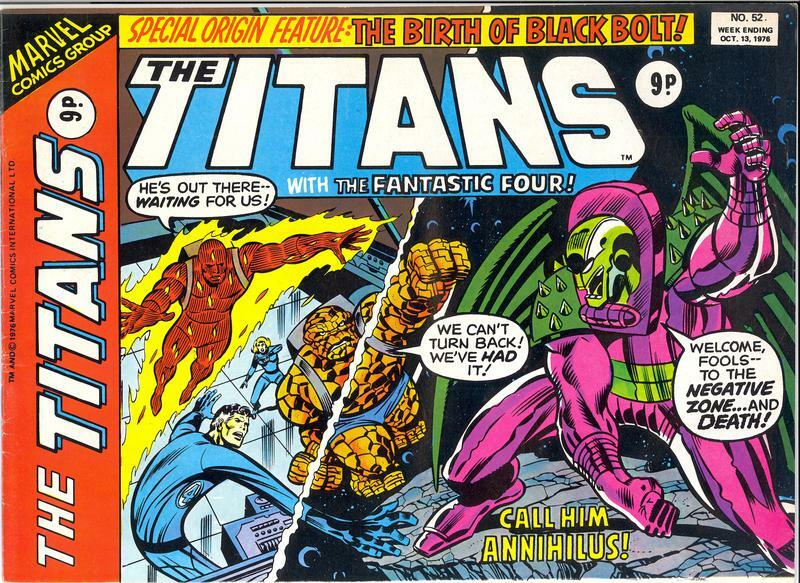 The line began with Spider-Man, the Fantastic Four, Star Heroes (featuring TV tie-in Battlestar Galactica and the toy-based strip the Micronauts continued from their previous run in Star Wars Weekly), and Chiller (starring Dracula and the Man-Thing with occasional appearance from other horror-related characters). 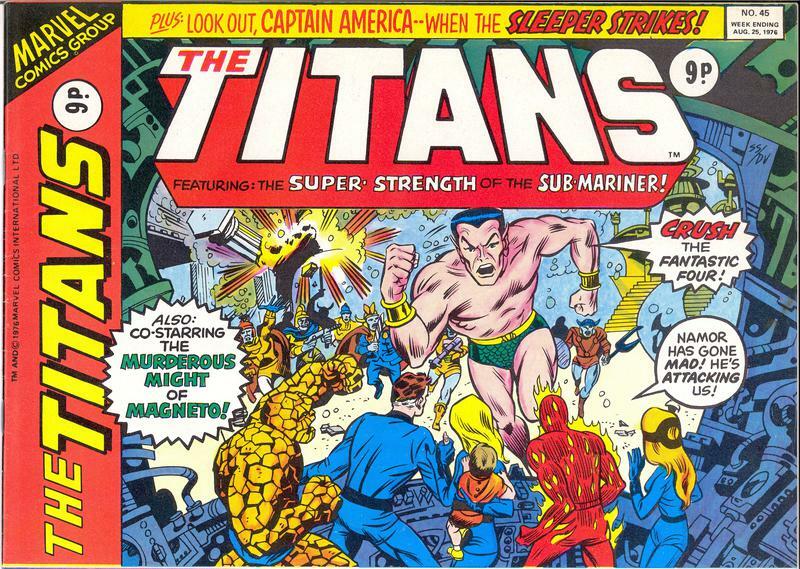 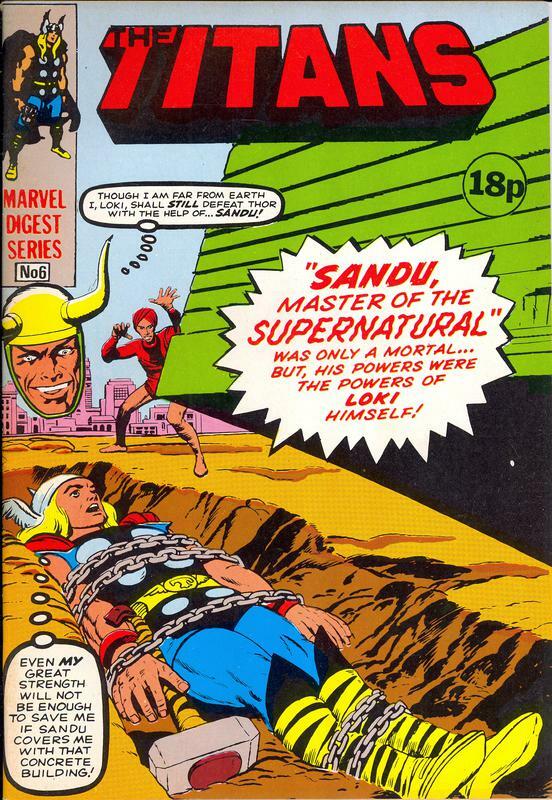 Following Skinn's belief that much of Marvel's strongest material was that published in the '60s and early '70s, many of these titles showcased strips from that period. 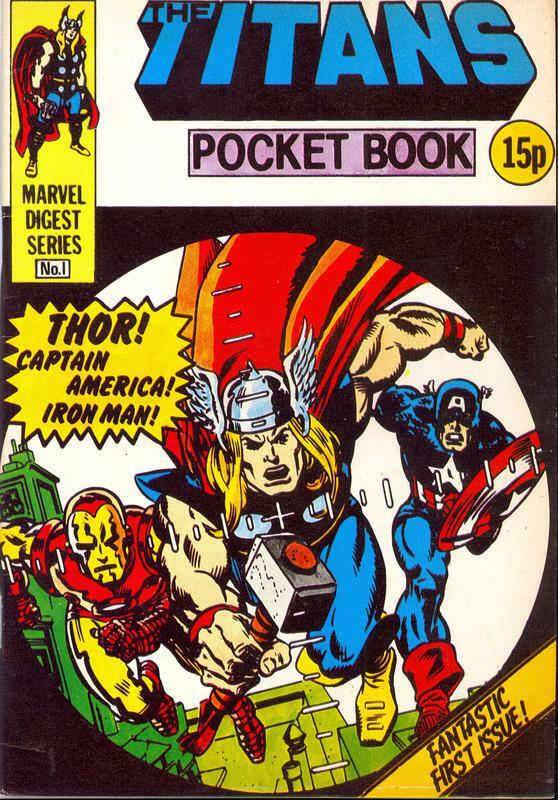 Skinn drew on the design of the traditional UK Picture Library titles which boomed in the '60s to establish a definitive look for the Pocket Books. 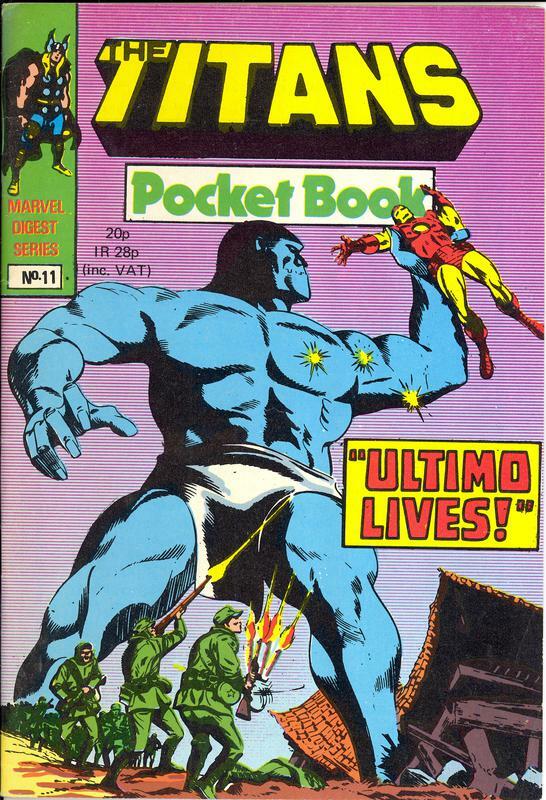 Skinn wrote that they "emulated the look in their Combat Picture Library covers ... that was the look I wanted, to pull the line of pocket books together visually and make them different to any of our other titles ...". 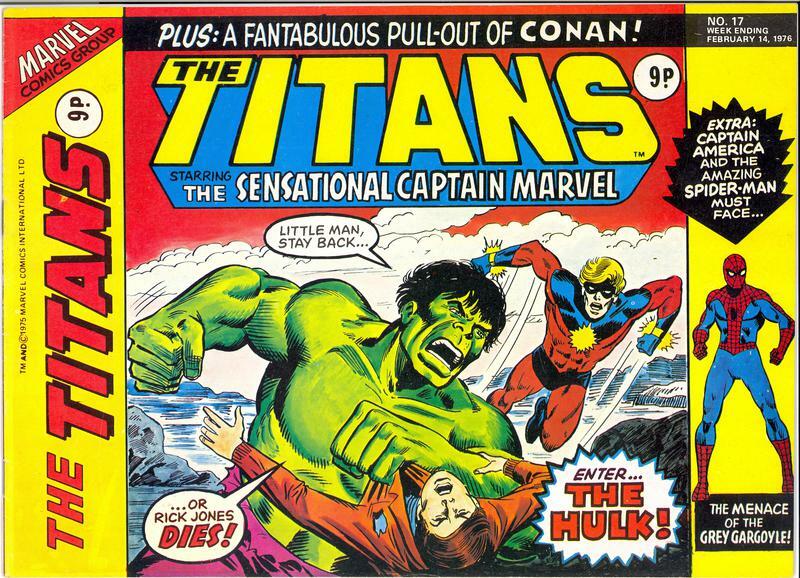 The first four titles were later joined by Hulk, The Titans (reprinting the '60s stories of Captain America, Thor and Iron Man), Marvel Classics Comics (featuring comic book adaptations of classic literature), Conan, and Young Romance. 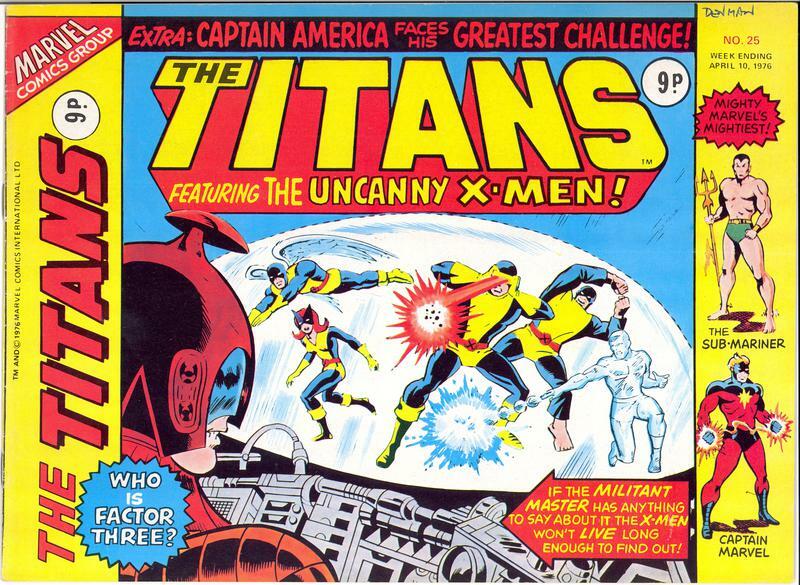 Some titles were not a success in terms of sales: Hulk, Conan, The Titans, Marvel Classics Comics, and Young Romance were cancelled after 13 issues, while Star Heroes (which had replaced The Micronauts with the original X-Men from issue #10) was re-launched as X-Men Pocket Book from #14. 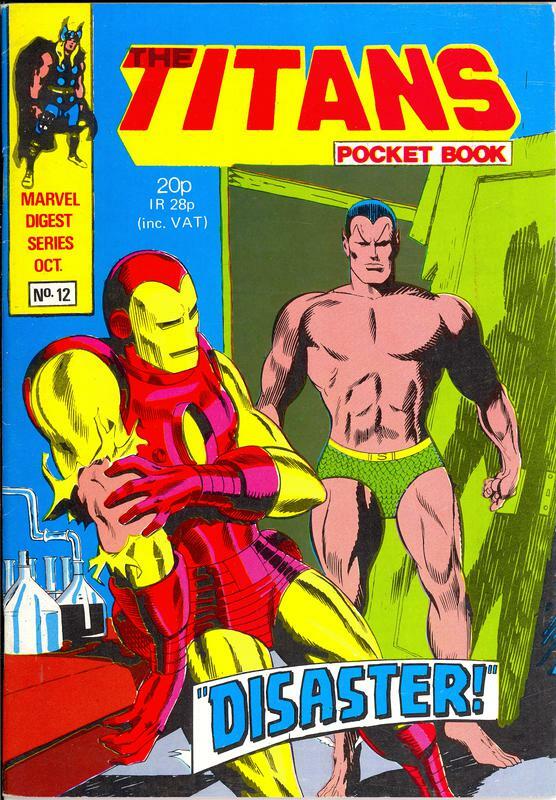 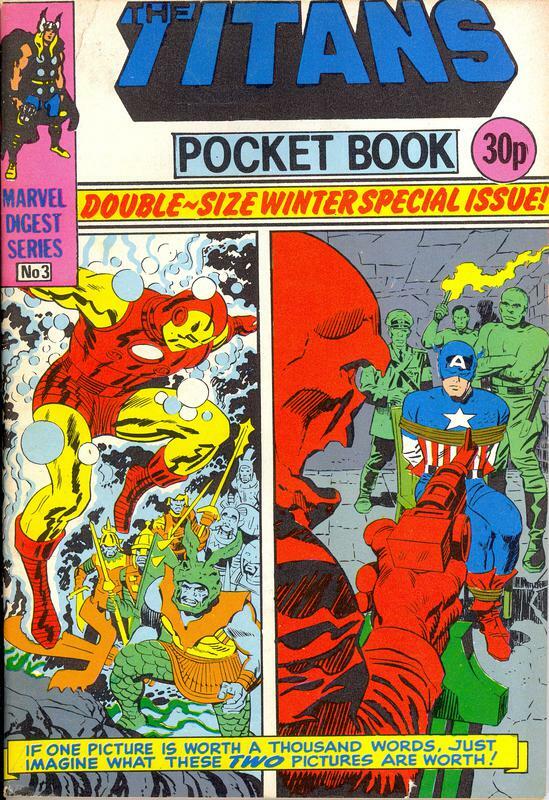 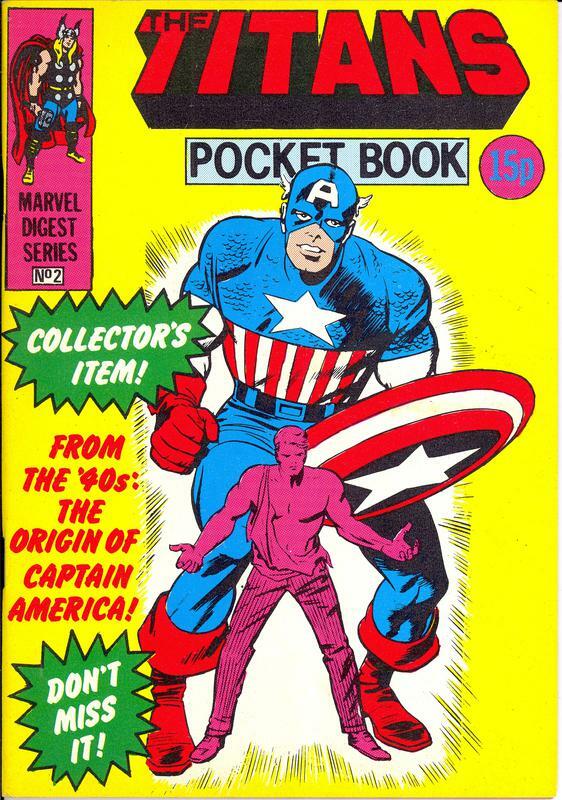 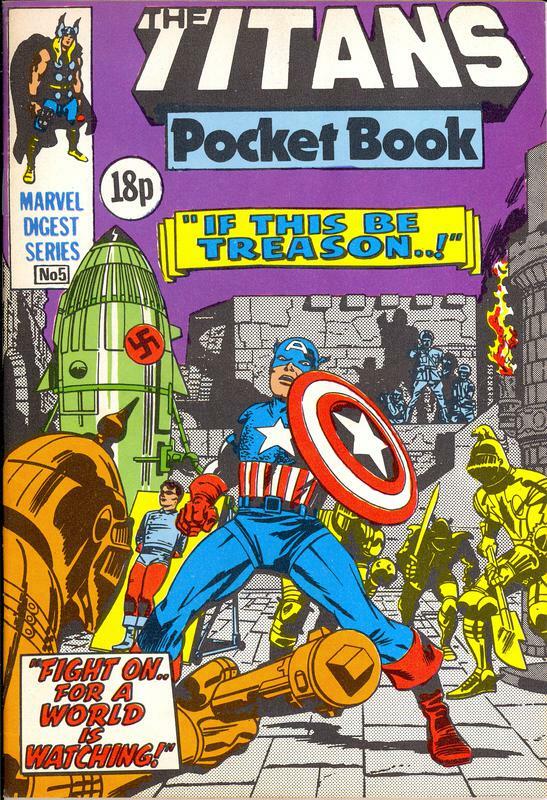 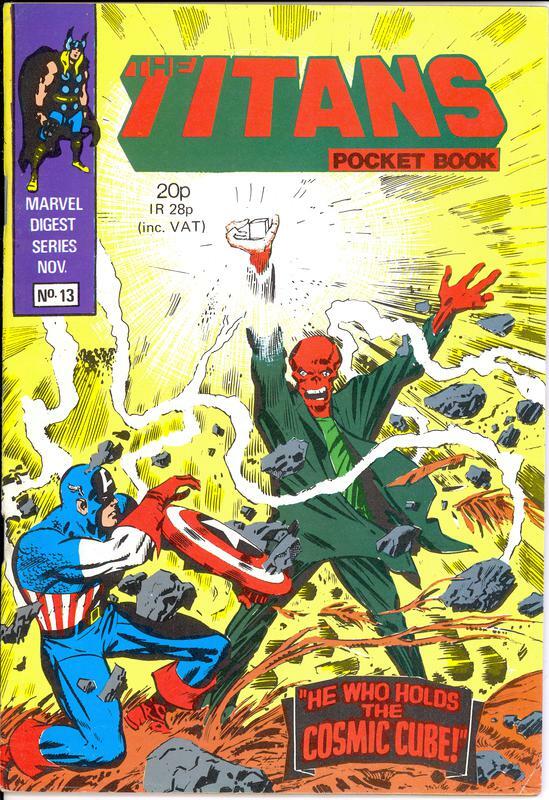 All other Pocket Books were cancelled after issue 28 in July/August '82. 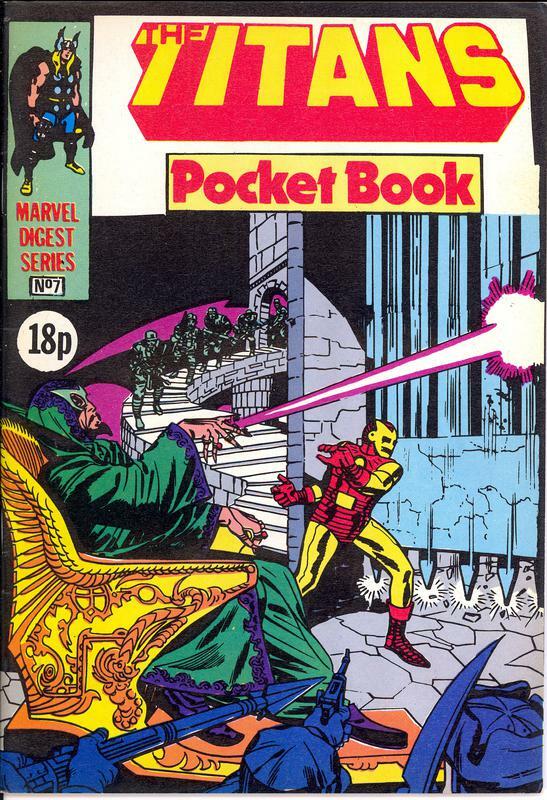 Classic Marvel material was by no means completely abandoned after the demise of the Pocket Books. 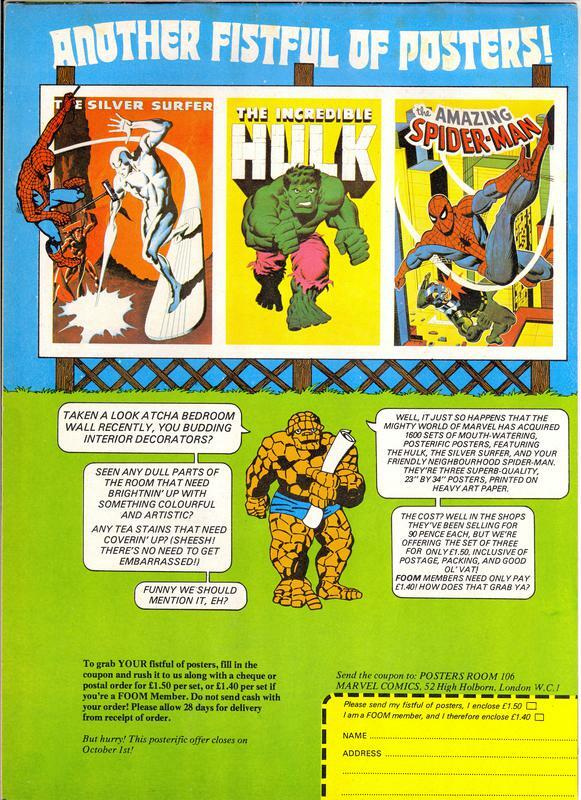 The Hulk strips continued in a newly launched The Incredible Hulk Weekly and similarly the classic Fantastic Four strips resurfaced in a weekly title in October '82. 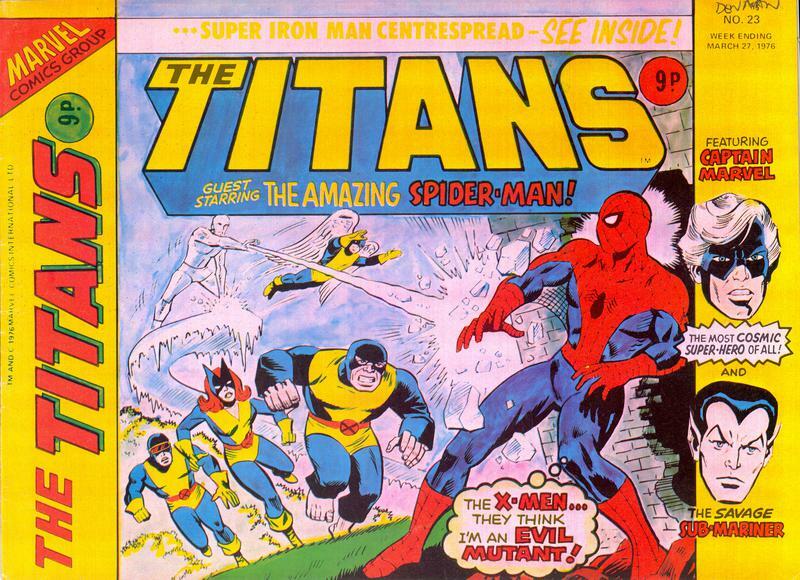 Both of these eventually folded into Spider-Man Comics Weekly, where the strips continued on and off until it changed into The Spider-Man Comic, aimed at younger readers. 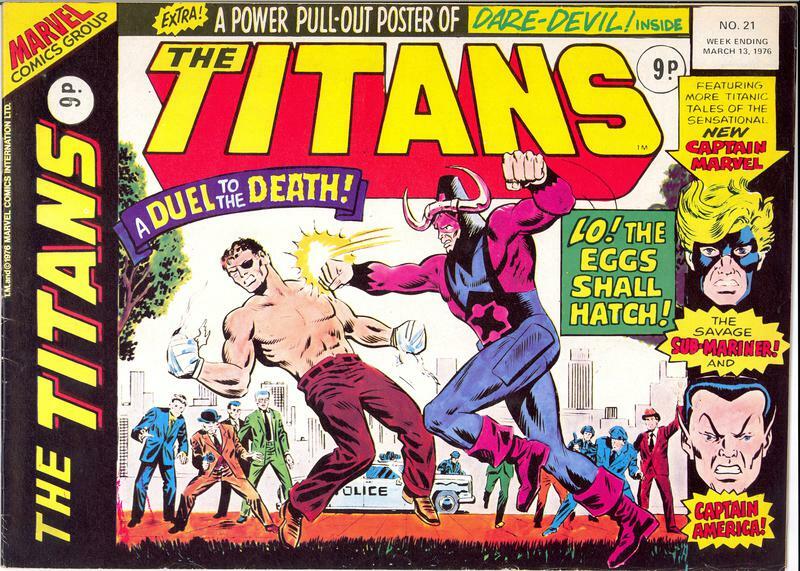 The classic Spider-Man material continued in the first few issues of The Daredevils. 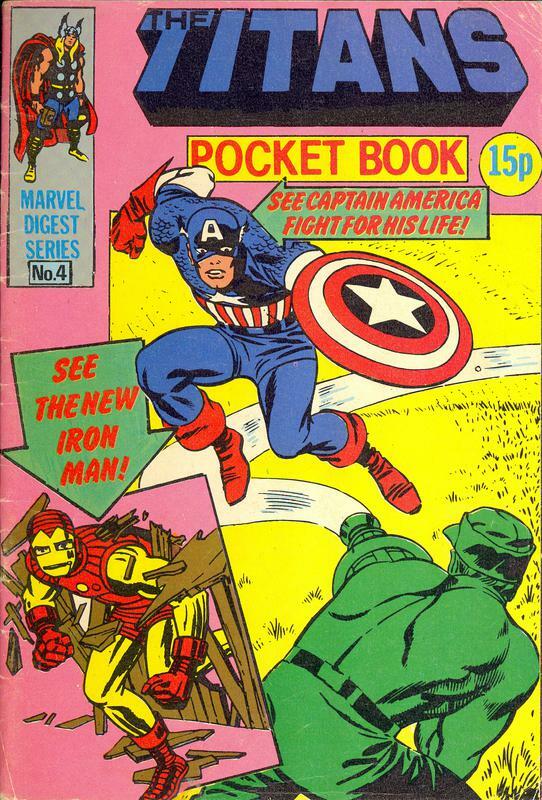 Not every back cover had something great on them (usually adverts for breakfast cereals or plastic model kits), but here's four covers that were well-worth scanning ..